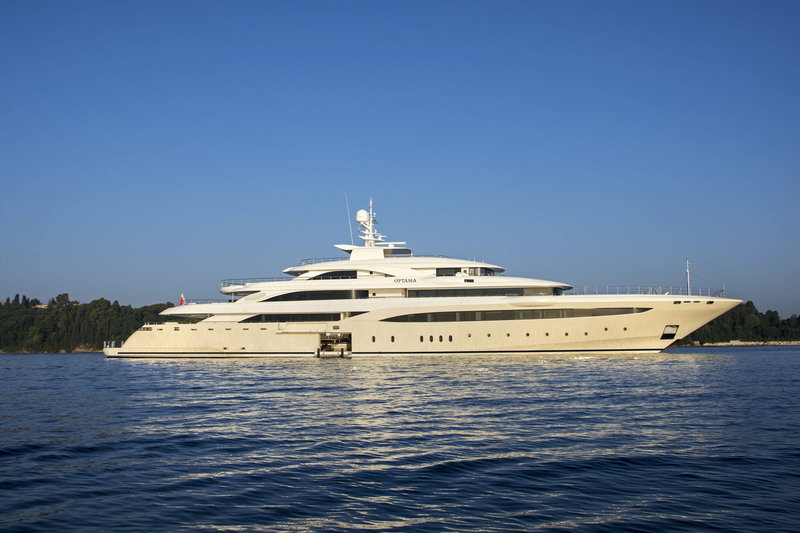 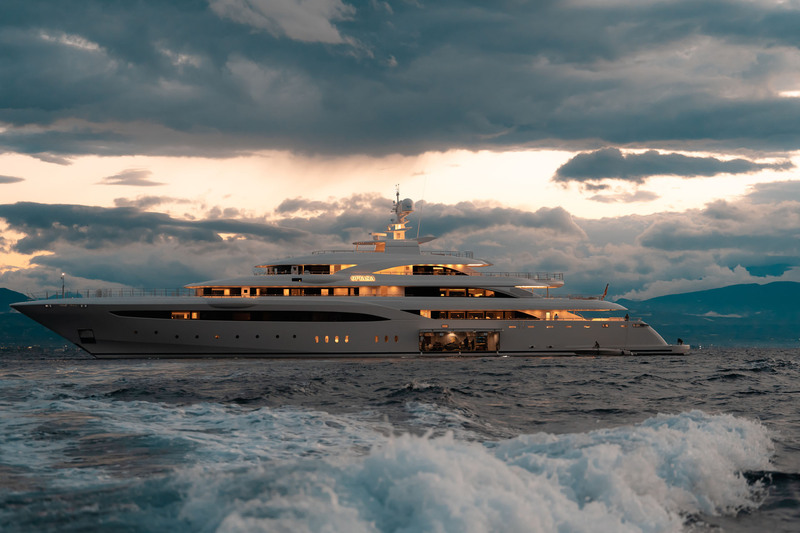 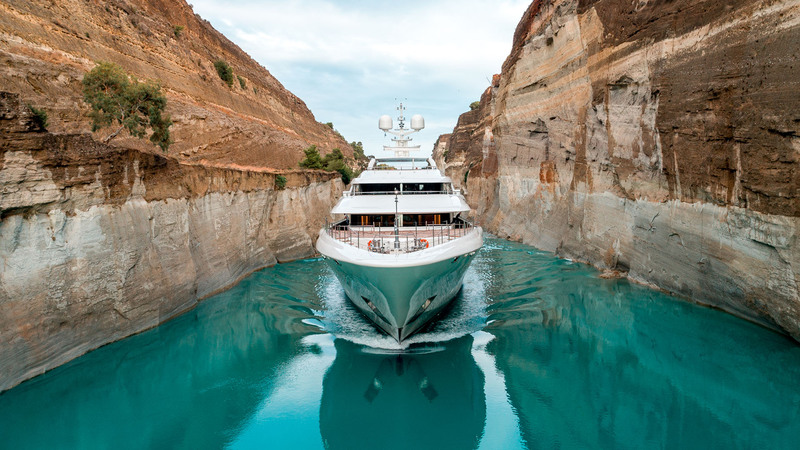 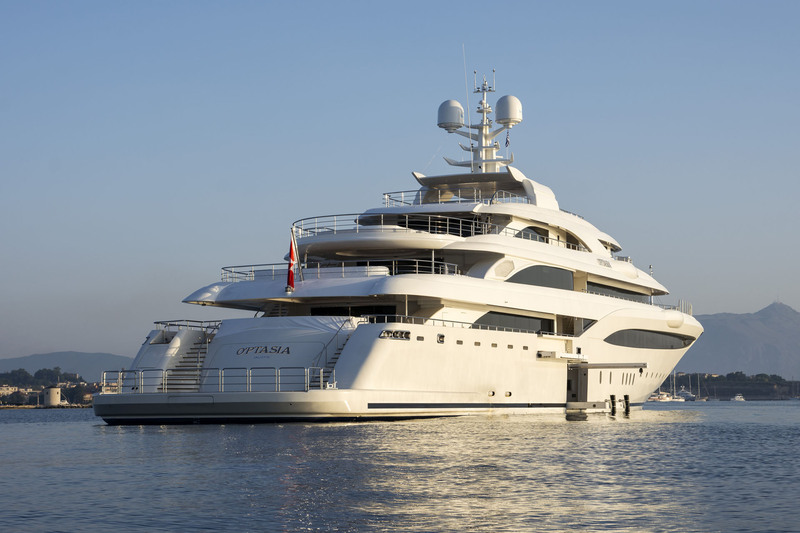 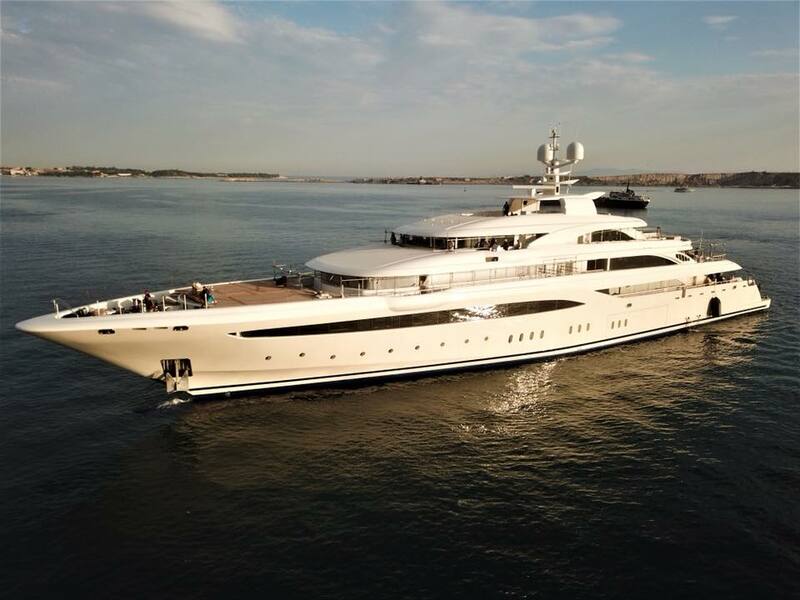 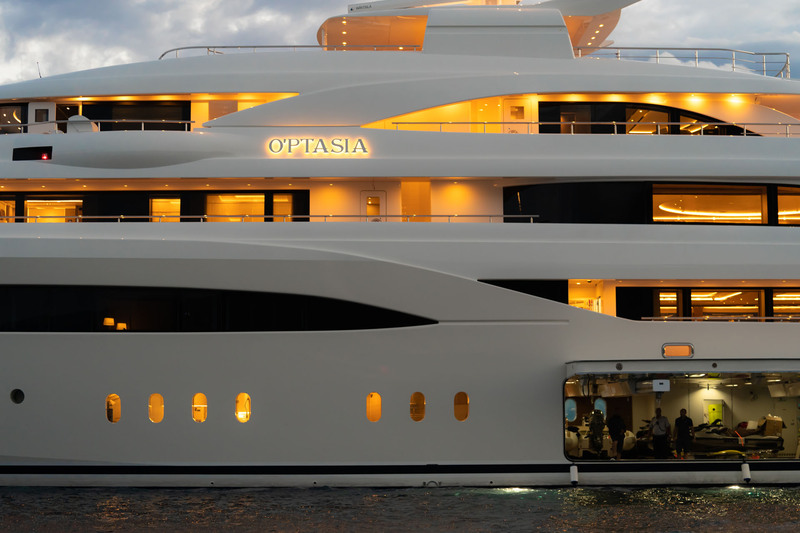 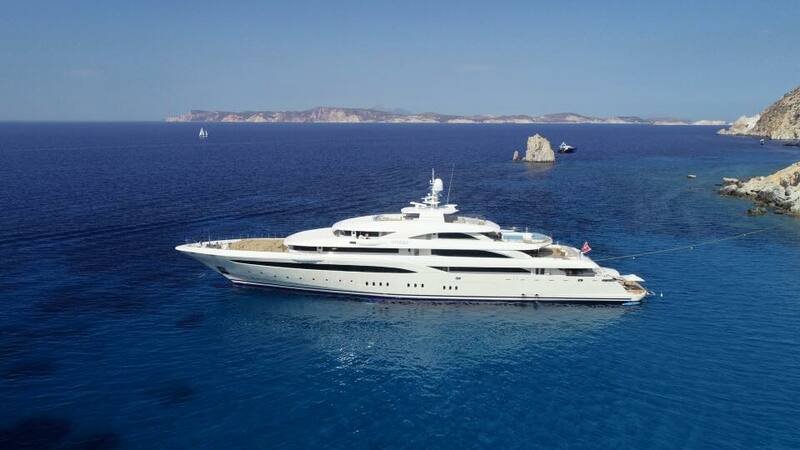 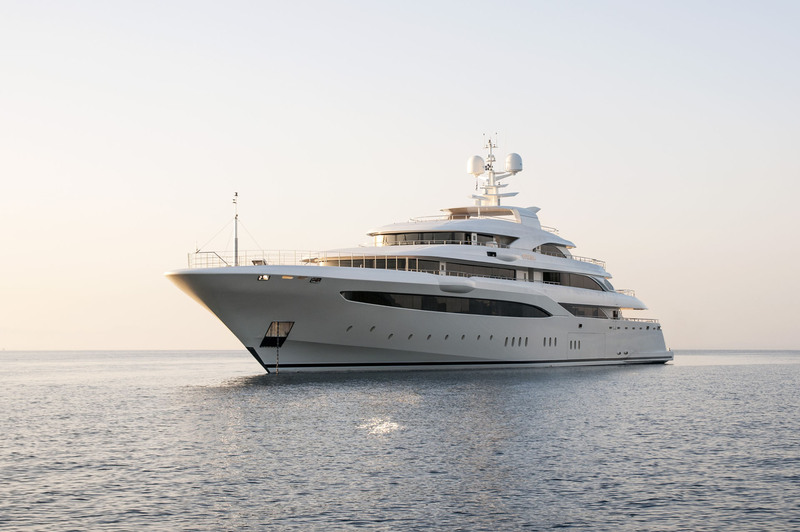 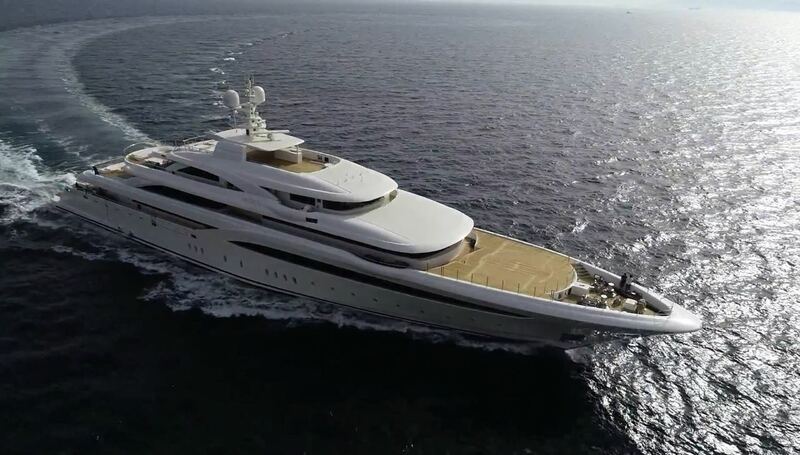 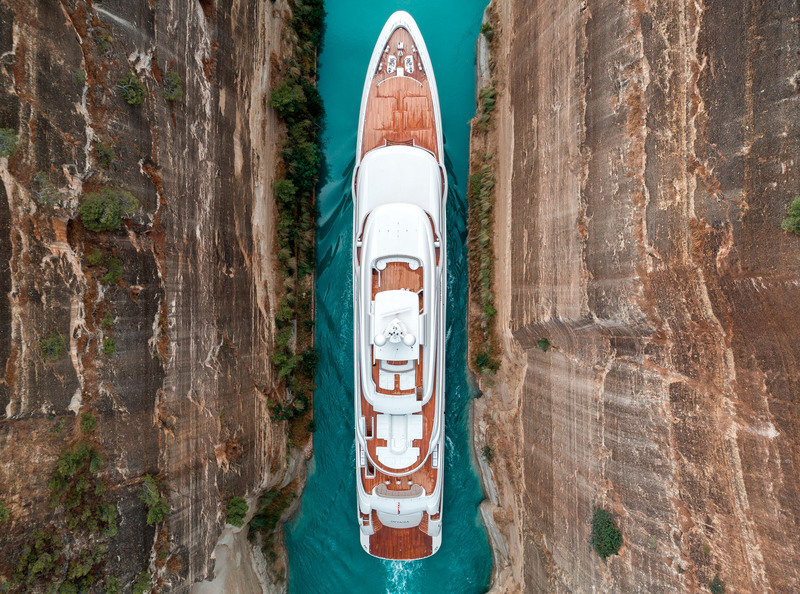 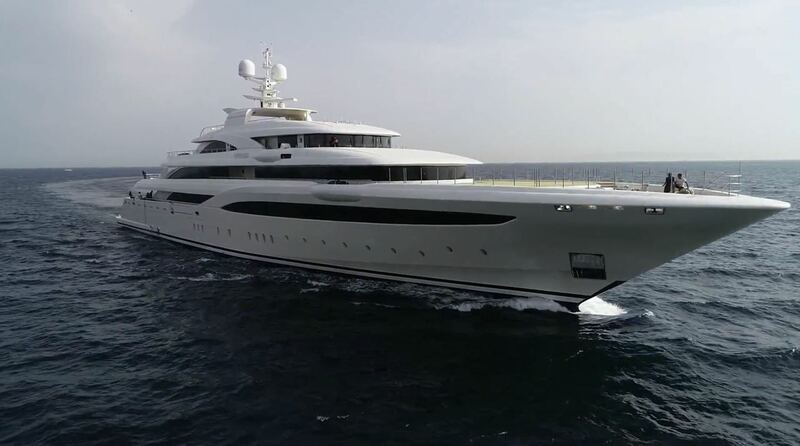 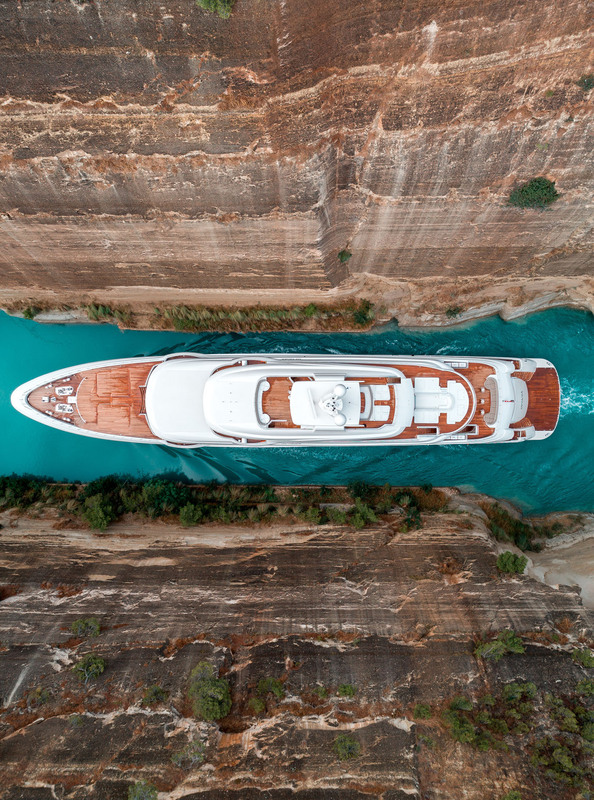 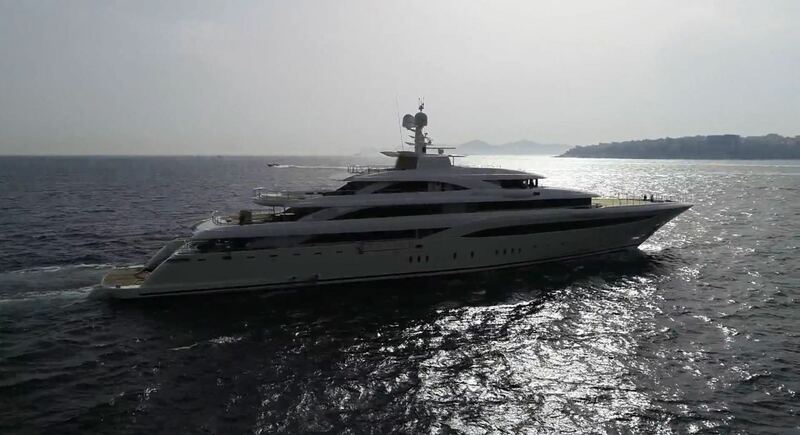 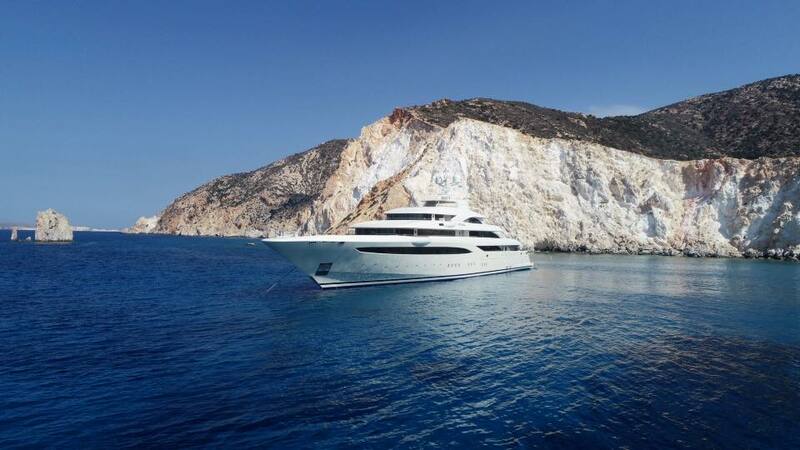 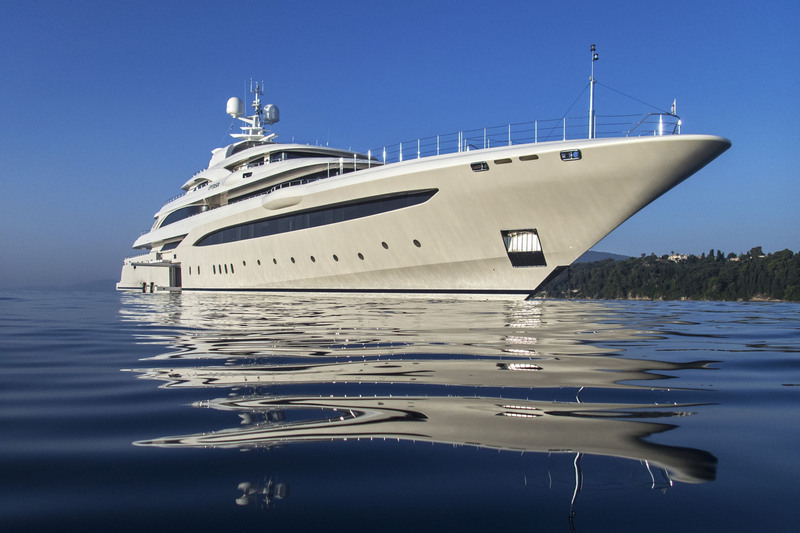 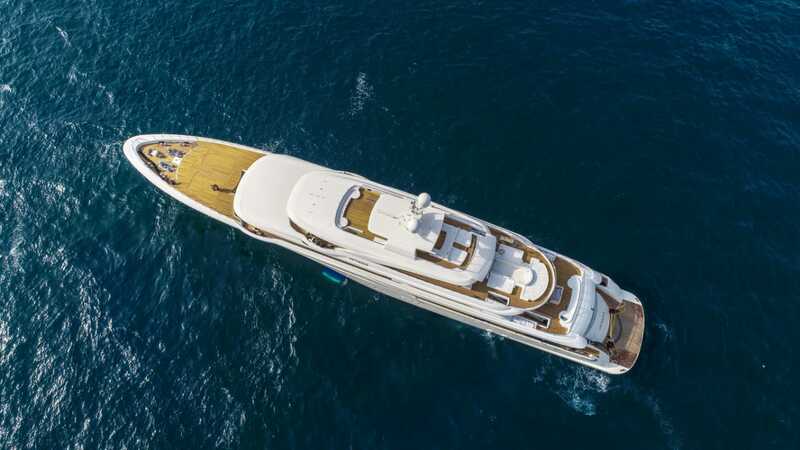 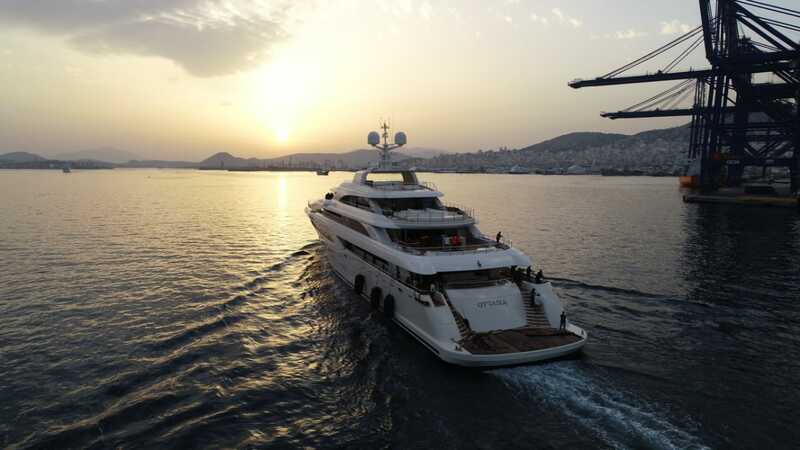 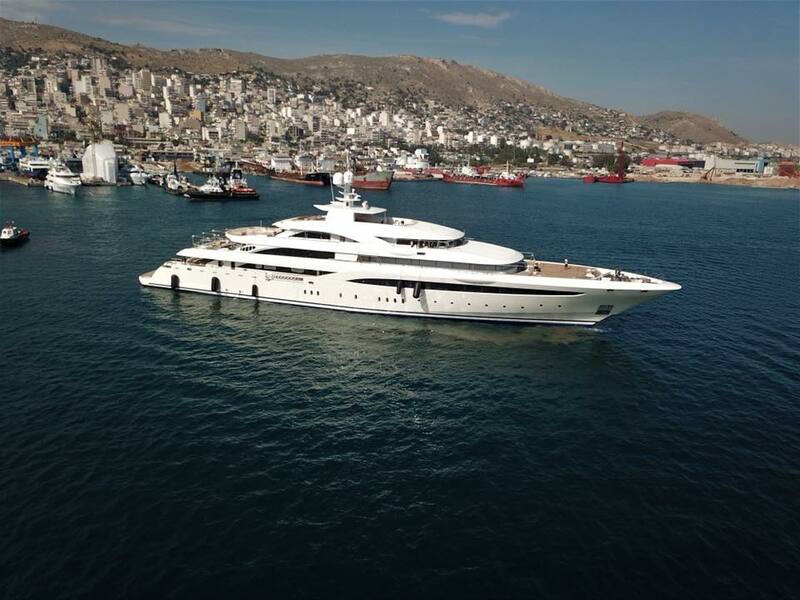 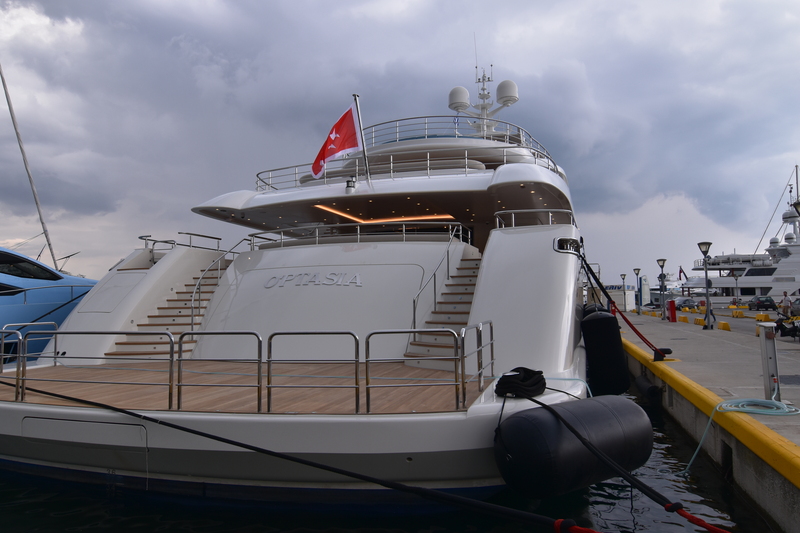 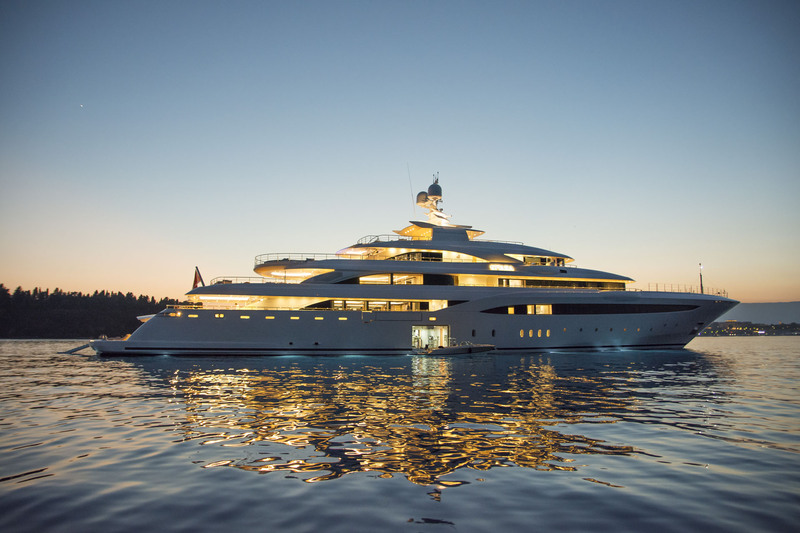 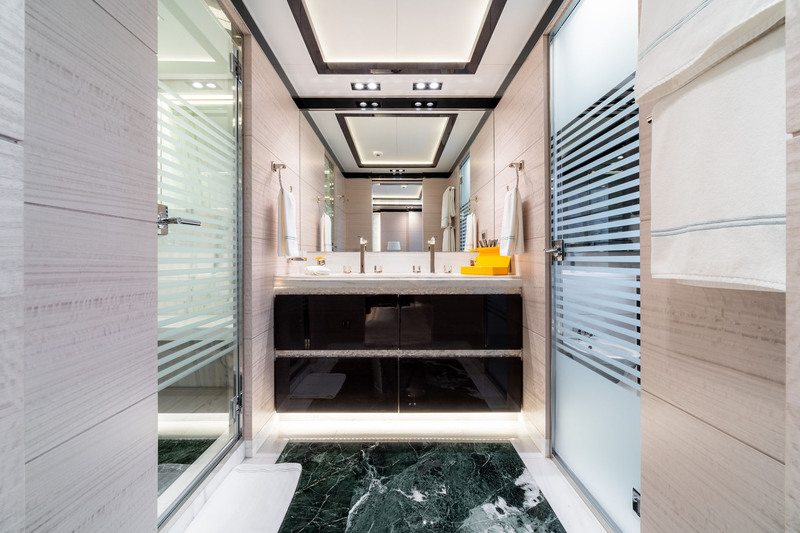 85m/278ft luxury yacht O'PTASIA was built by Golden Yachts and launched in 2018. 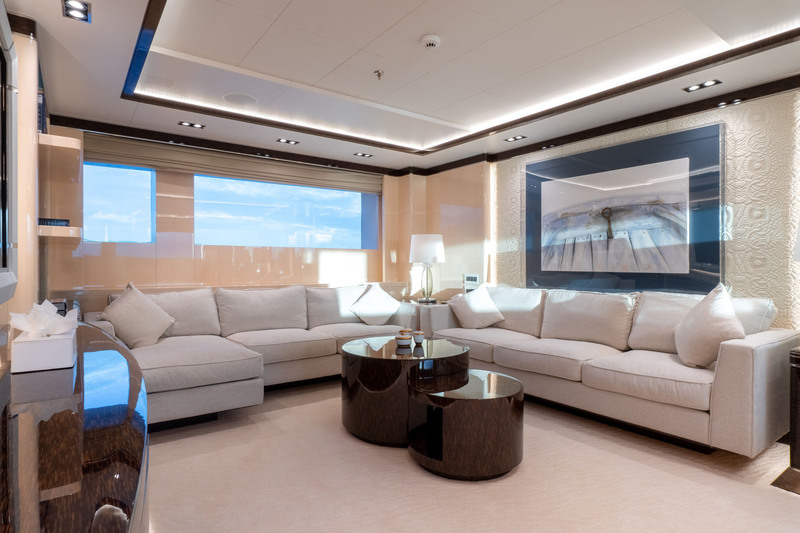 Her naval architecture was done by N. Hellas while her interior styling was completed by Giorgio Vafiadis. 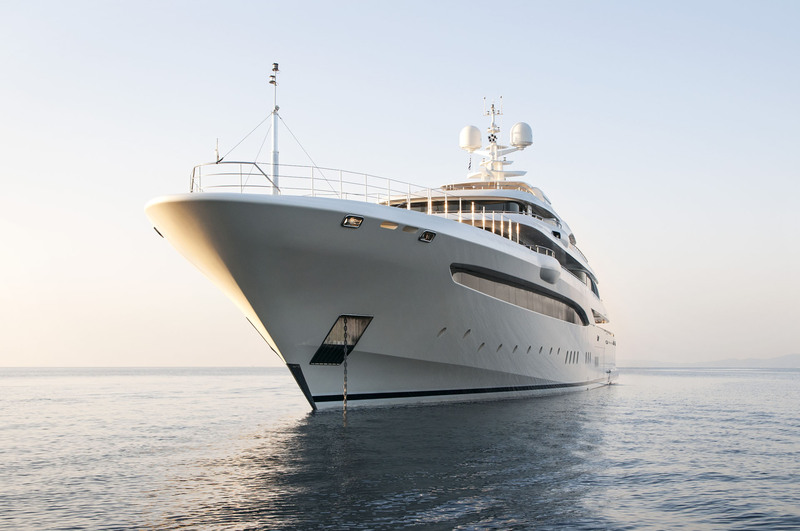 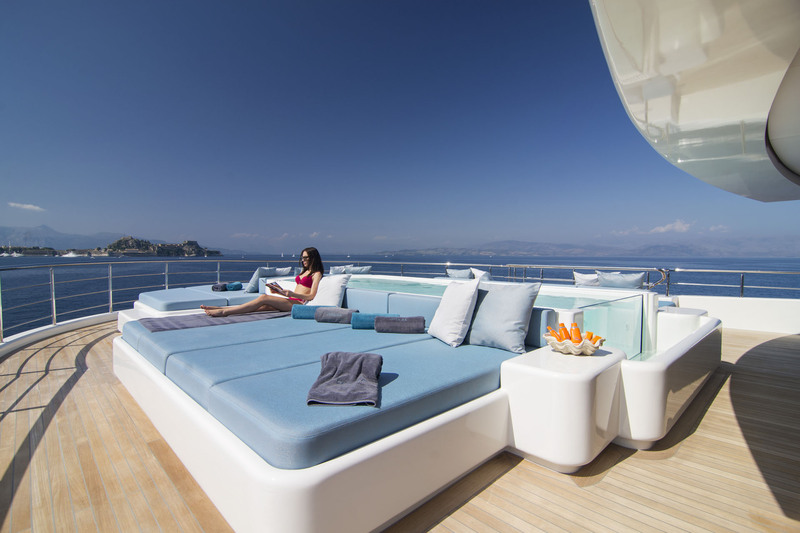 Her accommodation provides for 12 charter guests over 11 cabins. 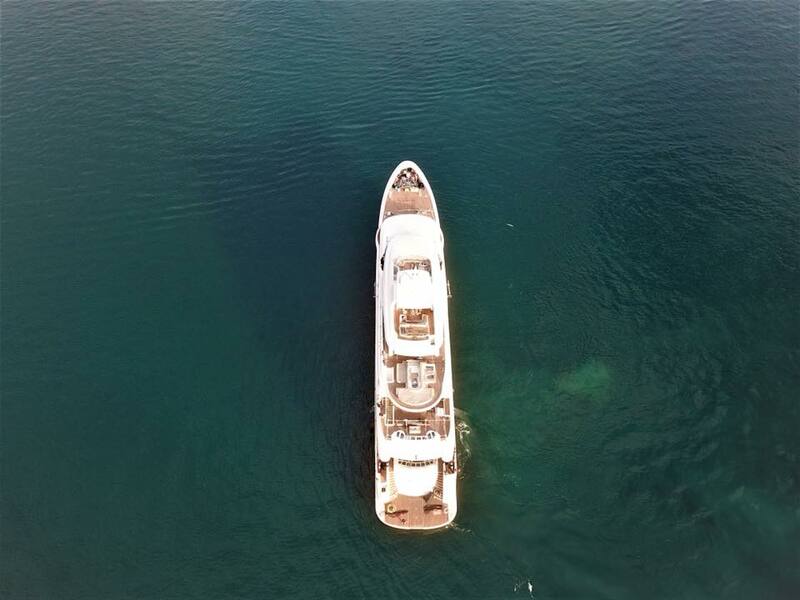 She is a fabulout ultra-luxurious charter yacht ideal for families or grous of friends, looking for a trylu unique experience. 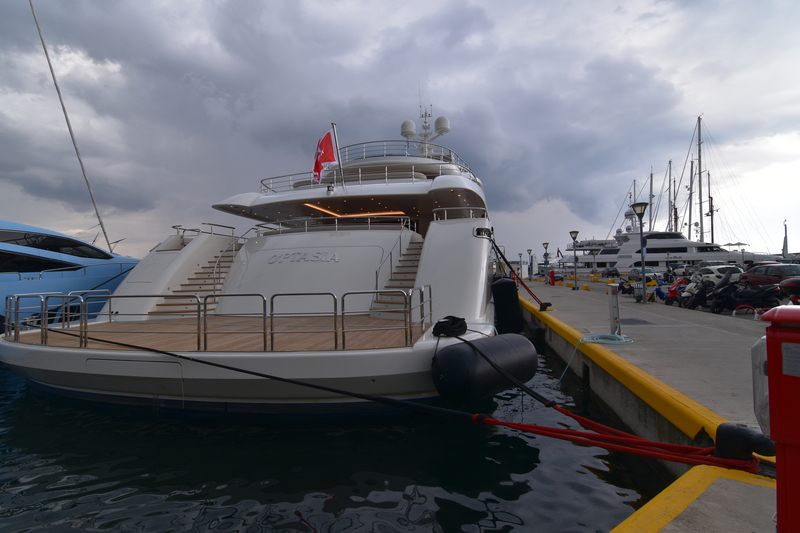 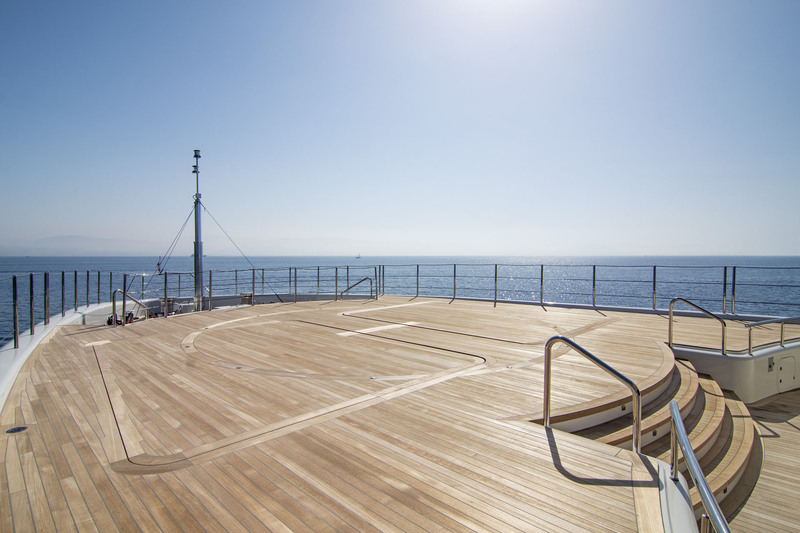 Guests arriving by tender or gangway platform will first step aboard on the lower deck swim platform, where two staircases lead up to the main deck aft. 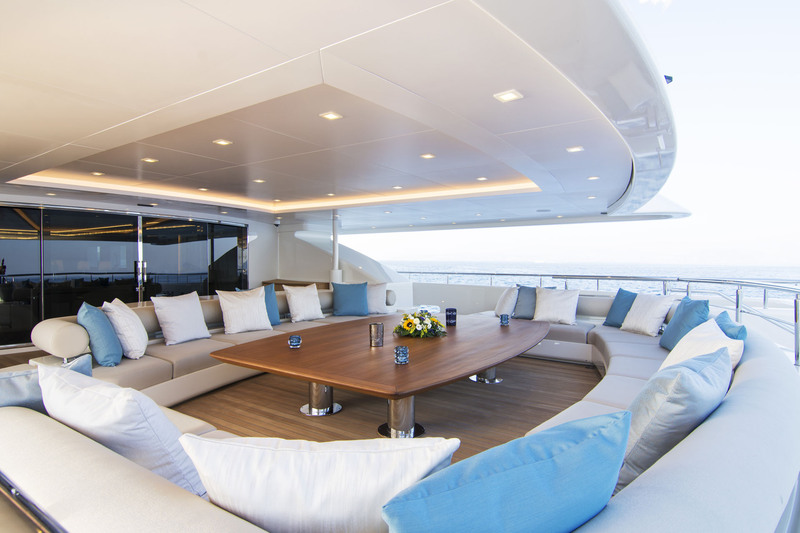 Here, a large sofa along the stern makes a comfortable waiting area or place to dine alfresco in the shade of the upper deck overhang. 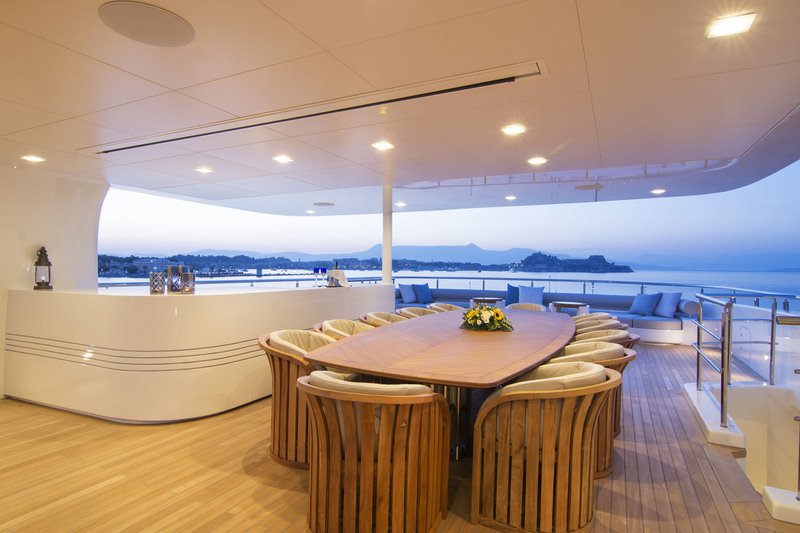 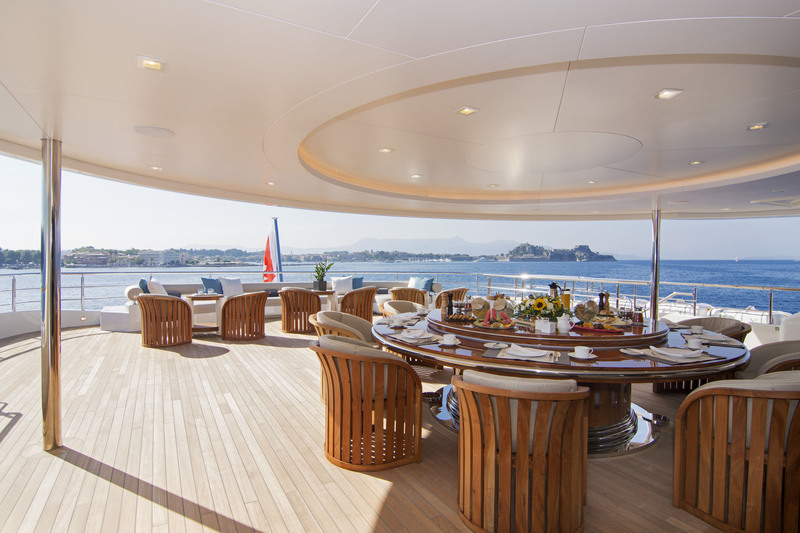 An outer stairway bridges the main deck and upper deck aft, the latter of which hosts a grand circular alfresco dining table ideal for formal occasions, seating up to 16 guests with views of the surrounding location. 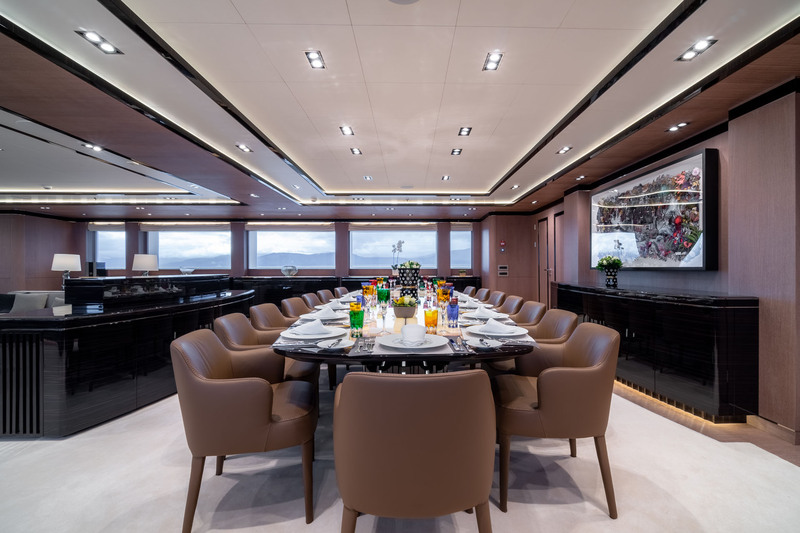 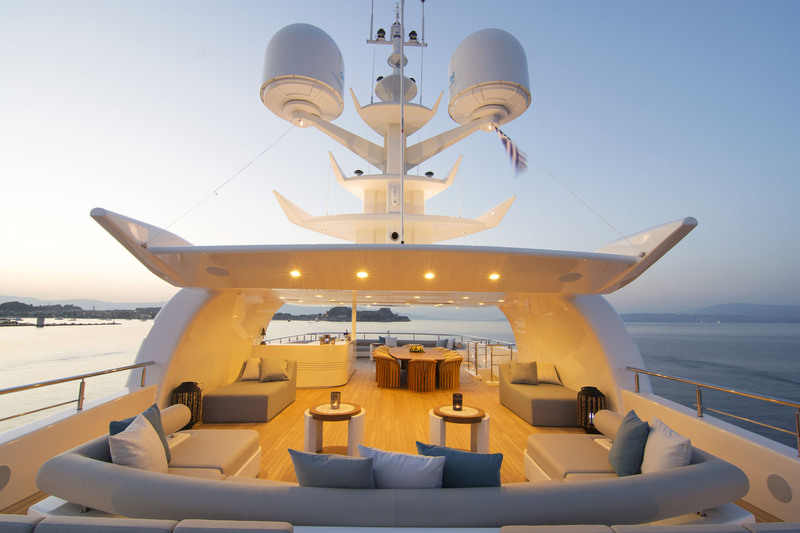 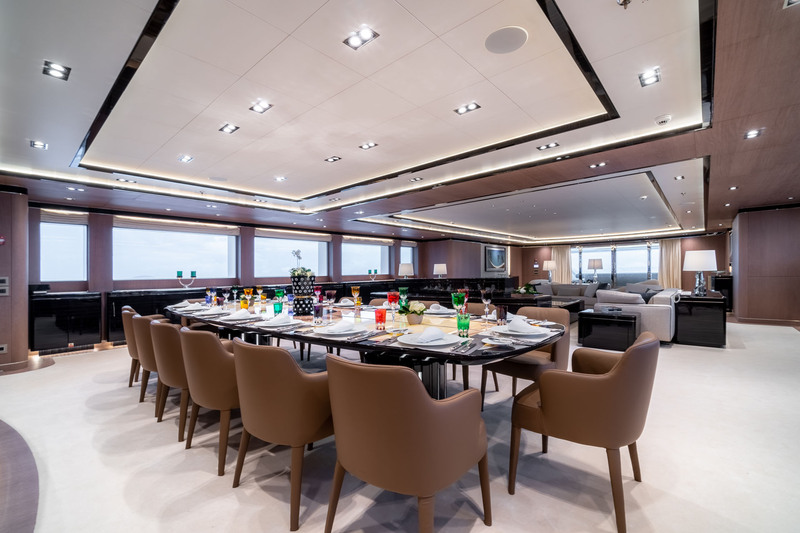 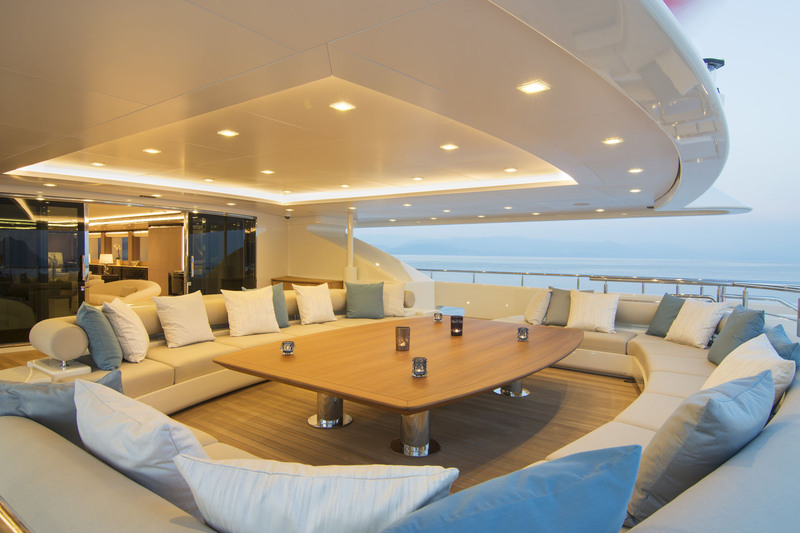 After a three-course meal, guests can rest on the elongated sofa along the stern and there are three small tables where the group can rest their drinks. 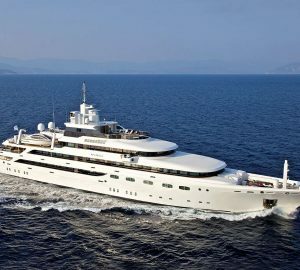 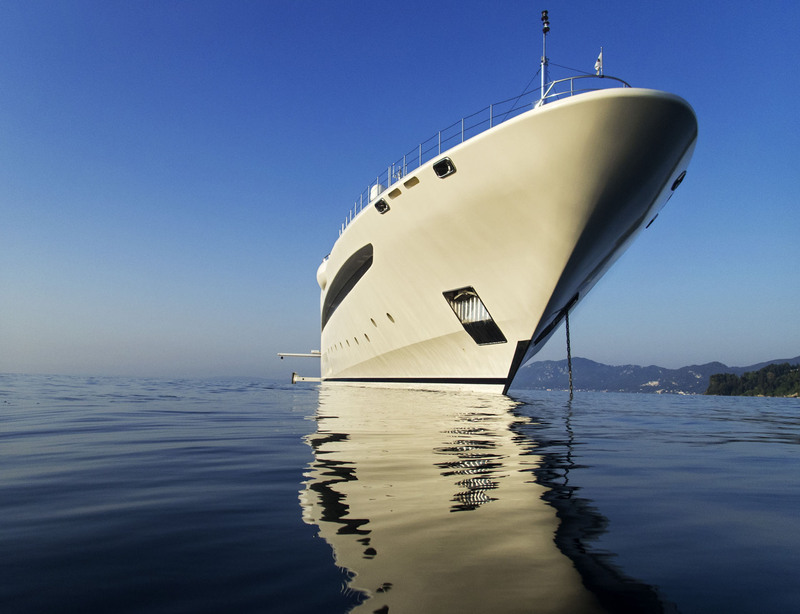 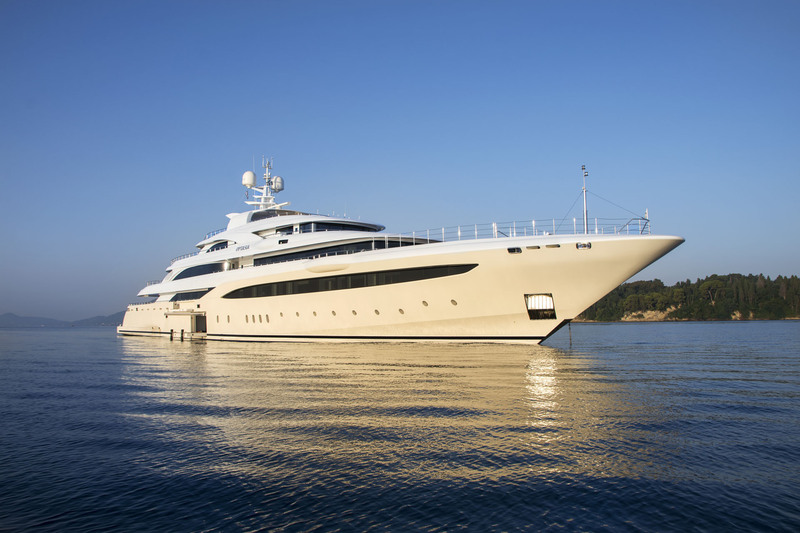 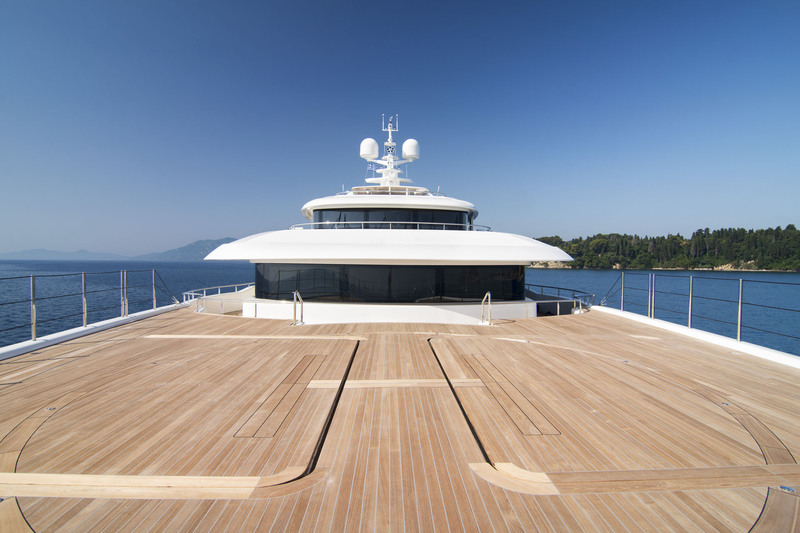 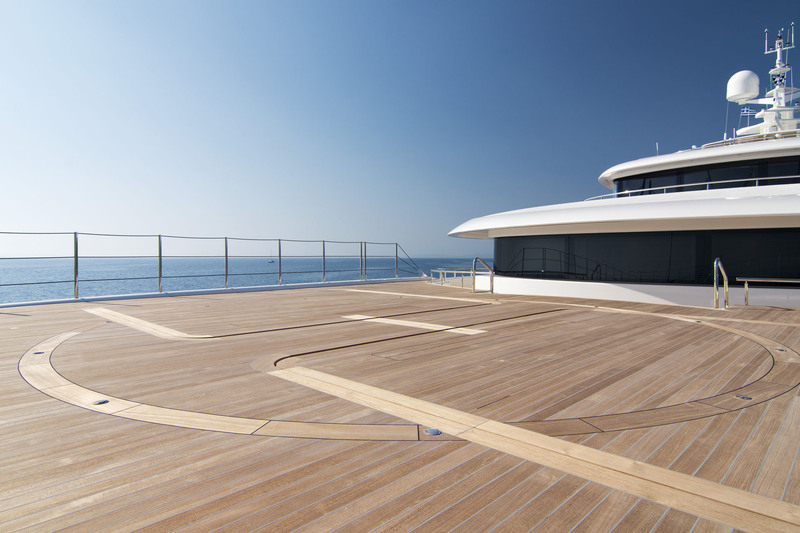 A helipad is located on the foredeck and when space is clear, it can be used for sunbathing or as an observation platform. 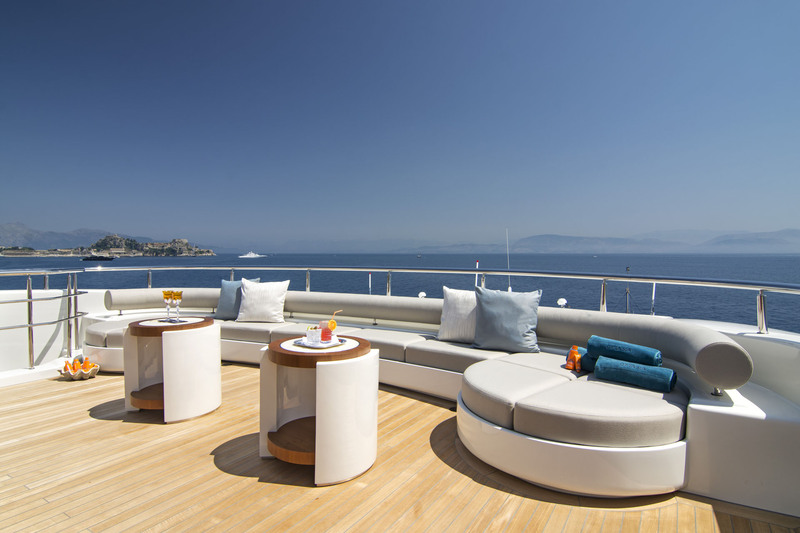 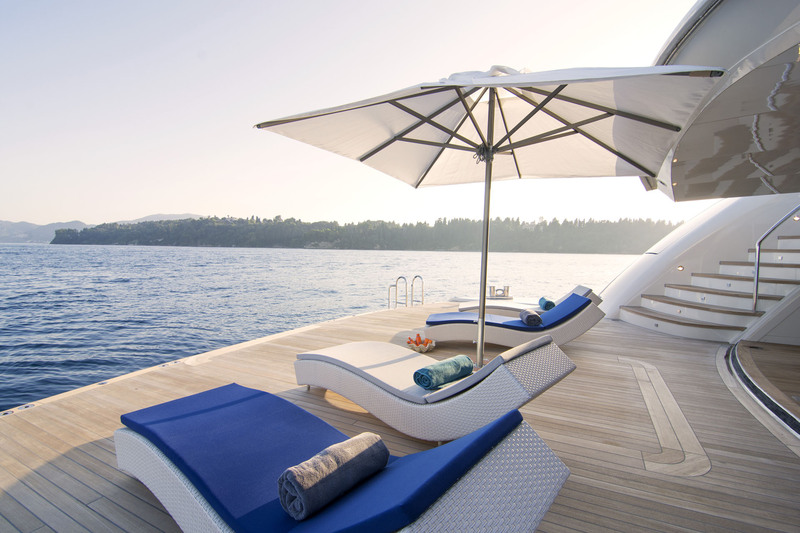 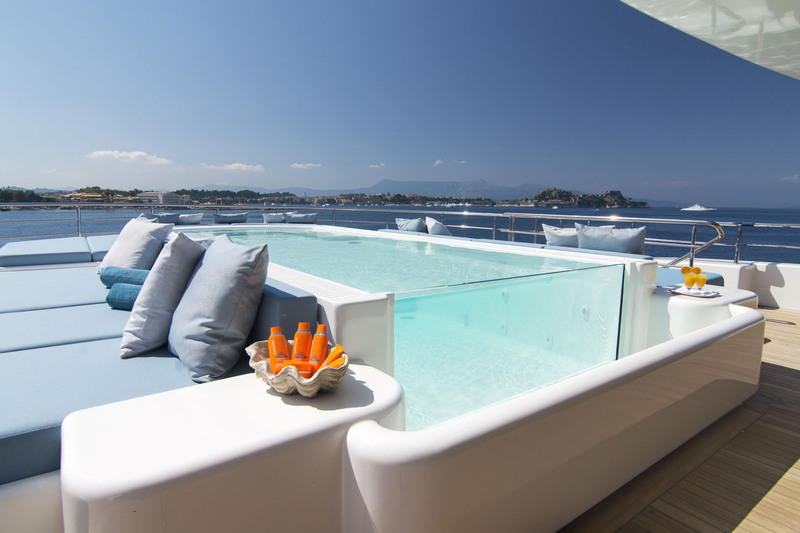 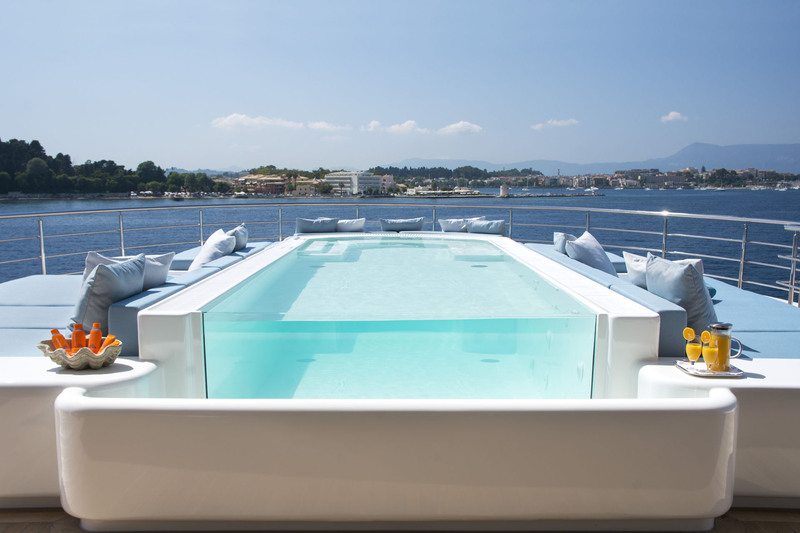 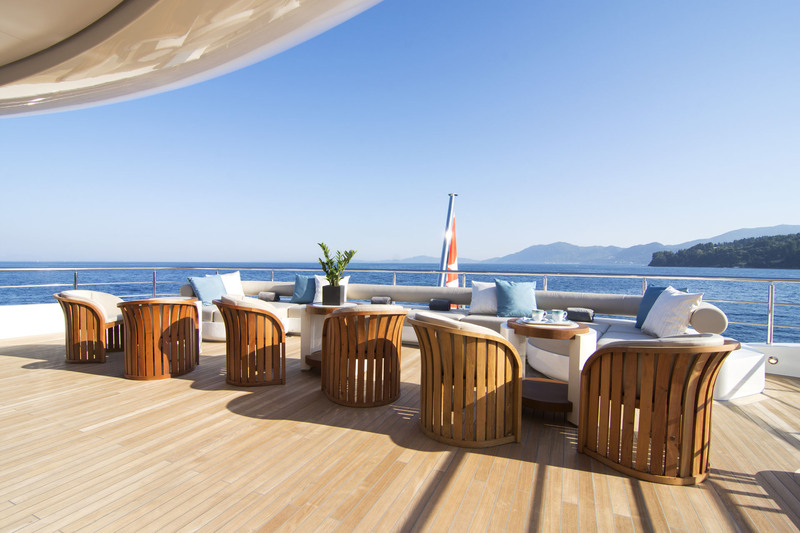 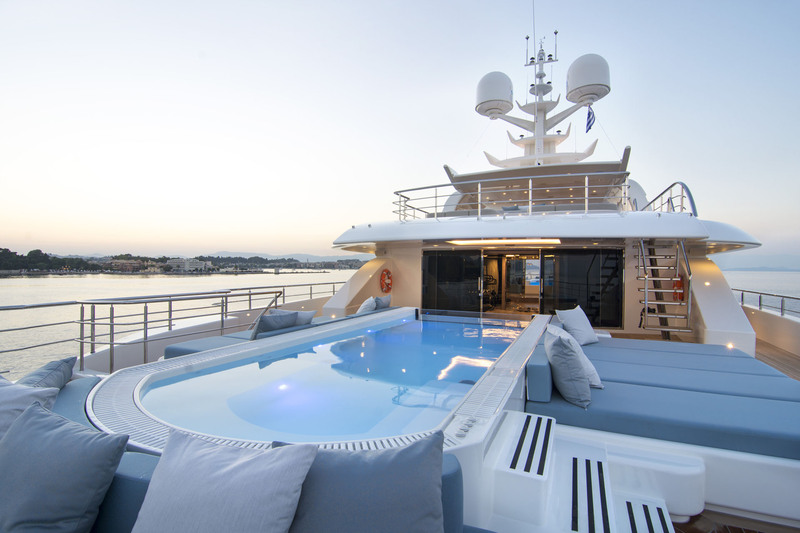 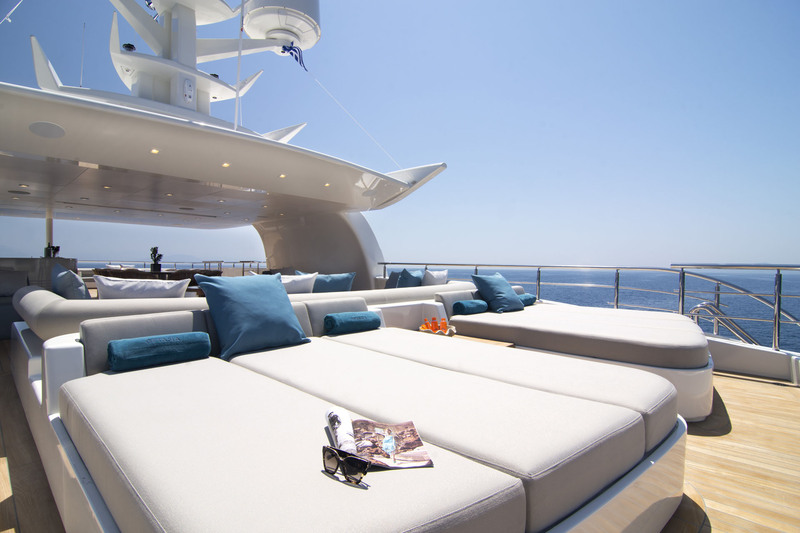 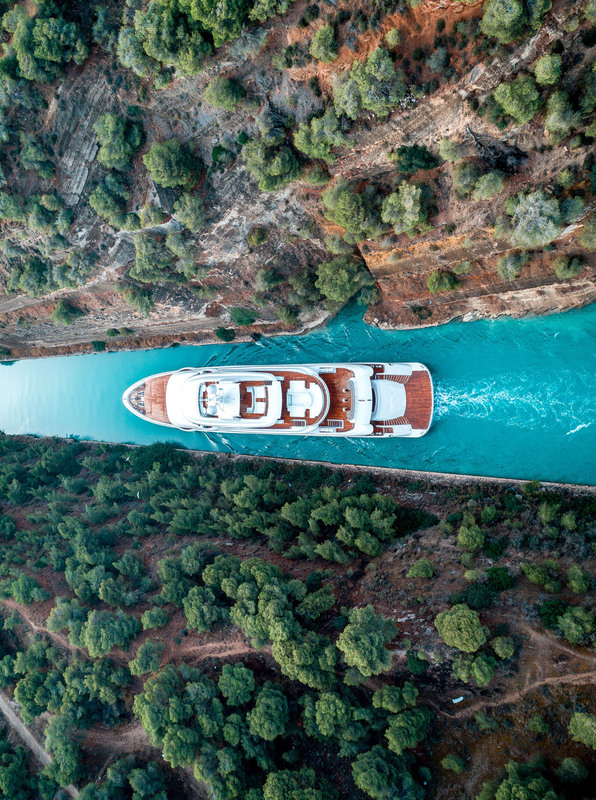 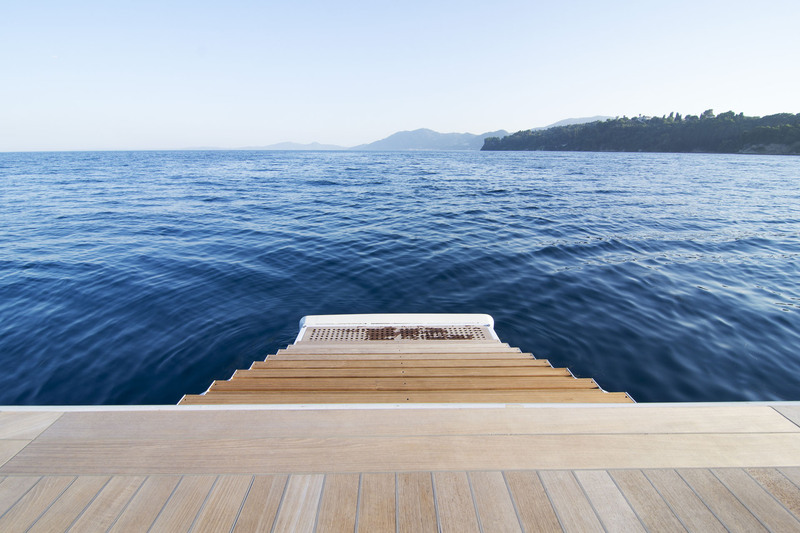 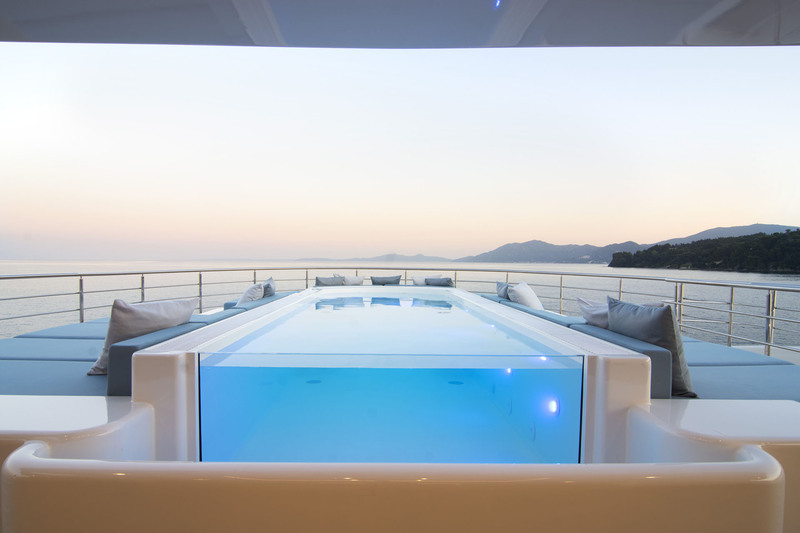 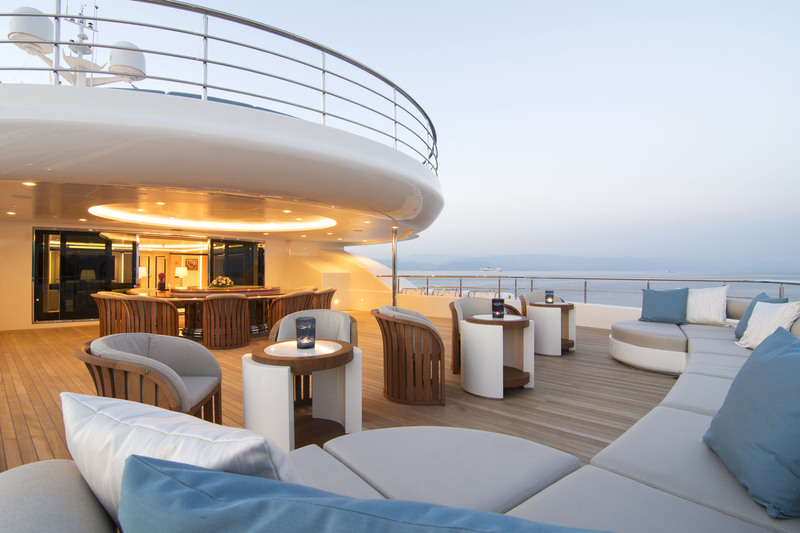 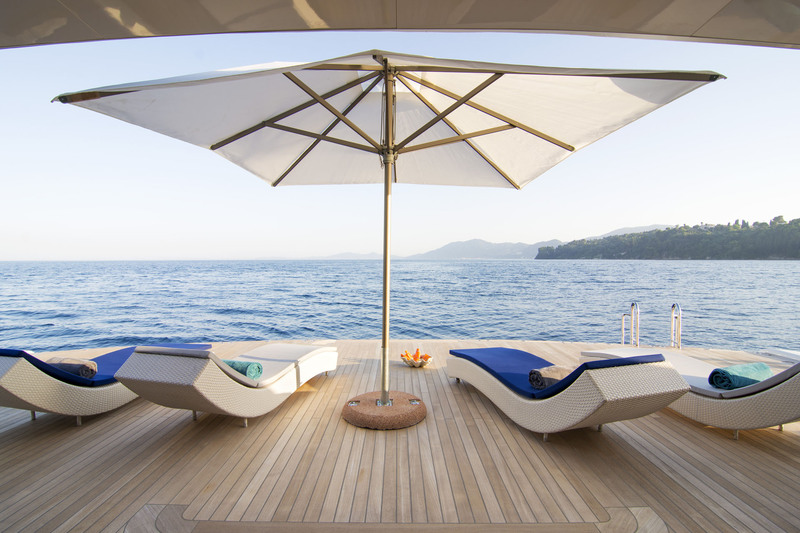 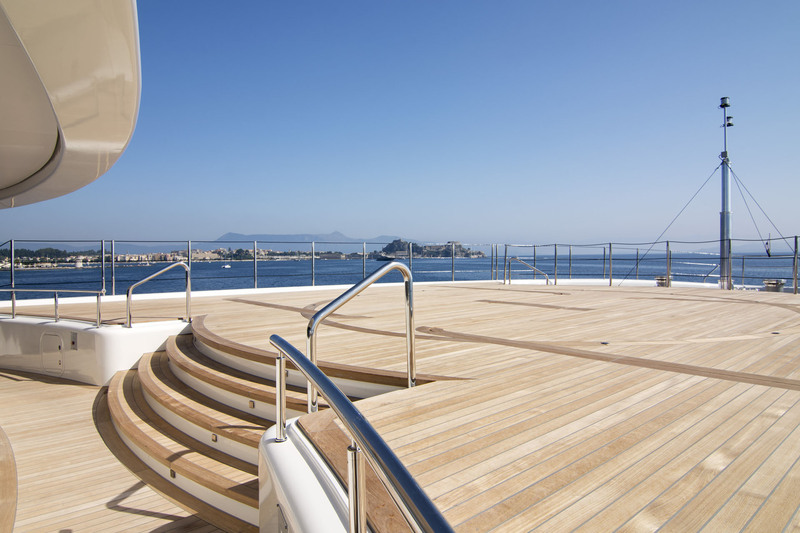 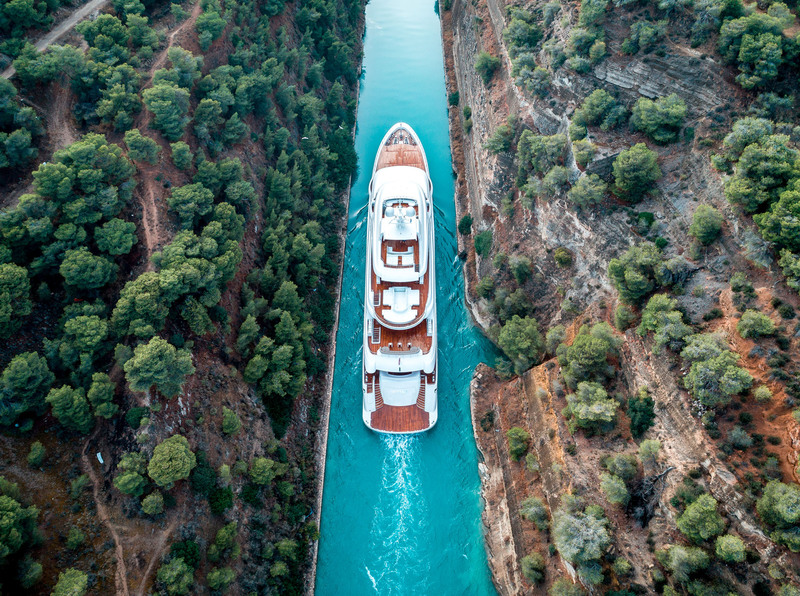 Above, the bridge deck aft is the focal point for daytime relaxation in the sunshine, offering a generous swimming pool 6m/20ft long and 5m/16ft wide, enclosed on three sides by immense sun pads where the whole group can gather. 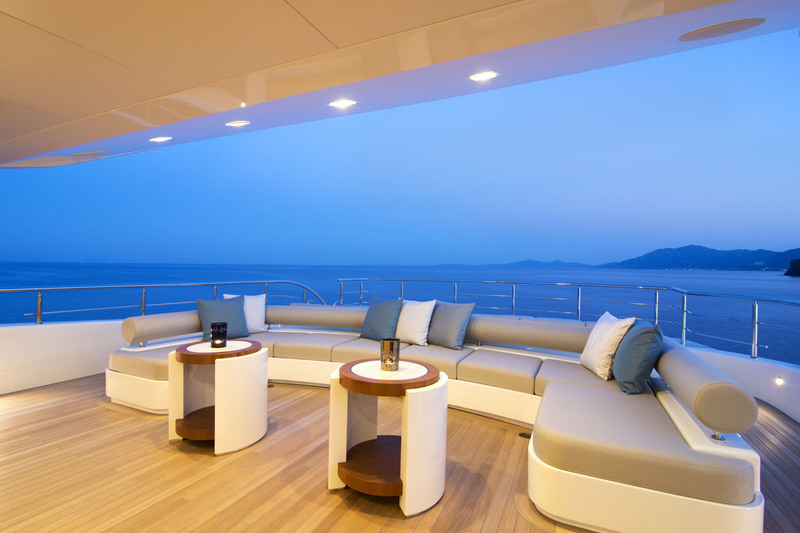 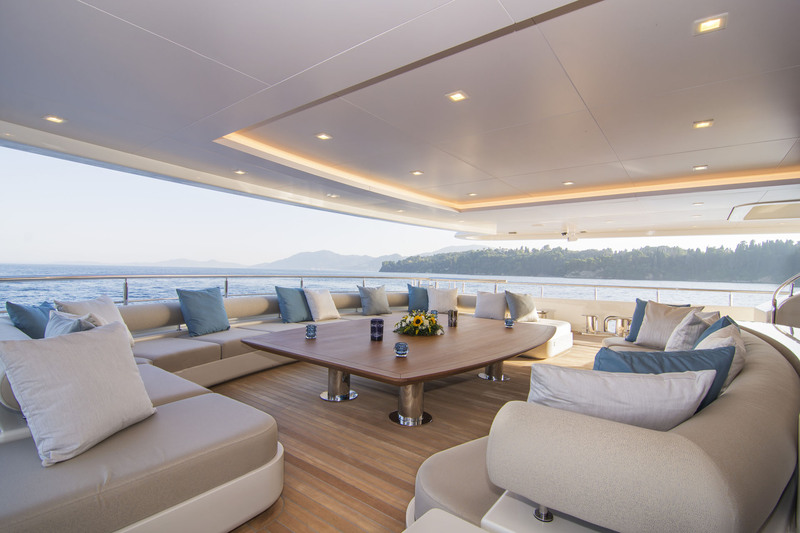 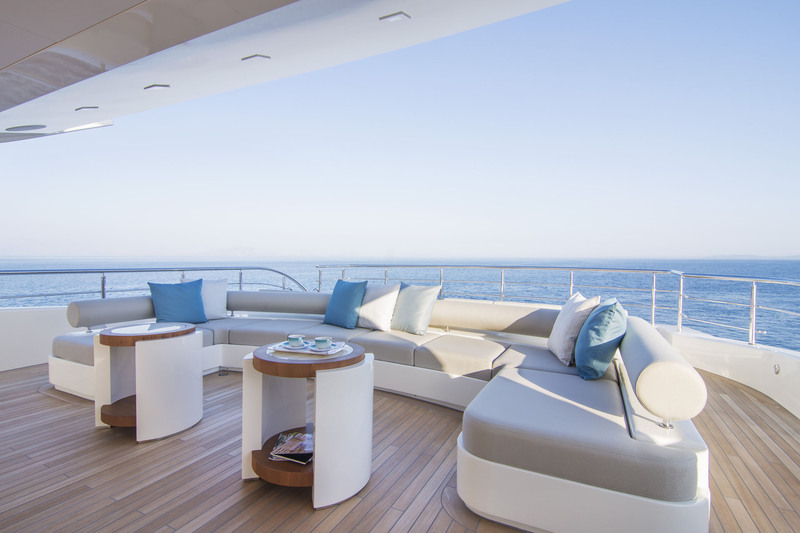 The sundeck is designed for group socialisation at any time of the day: The stern area is fitted with two generous sun pads in front of which is a forward-facing sofa. 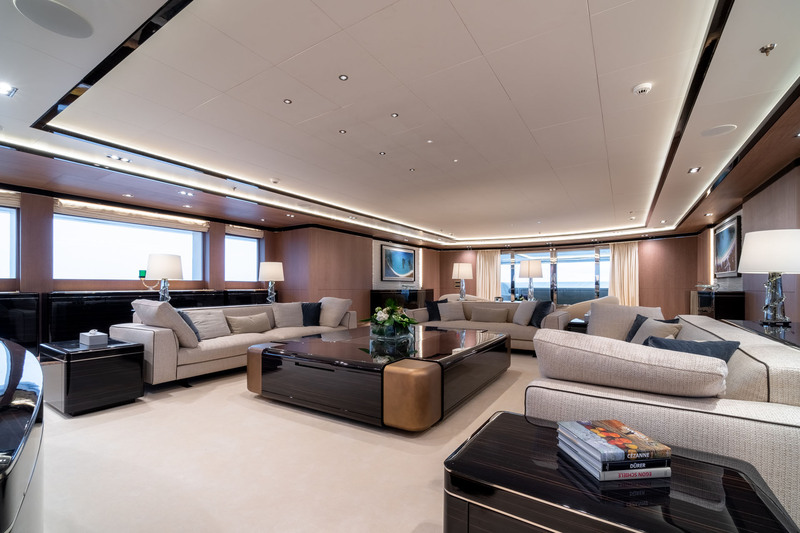 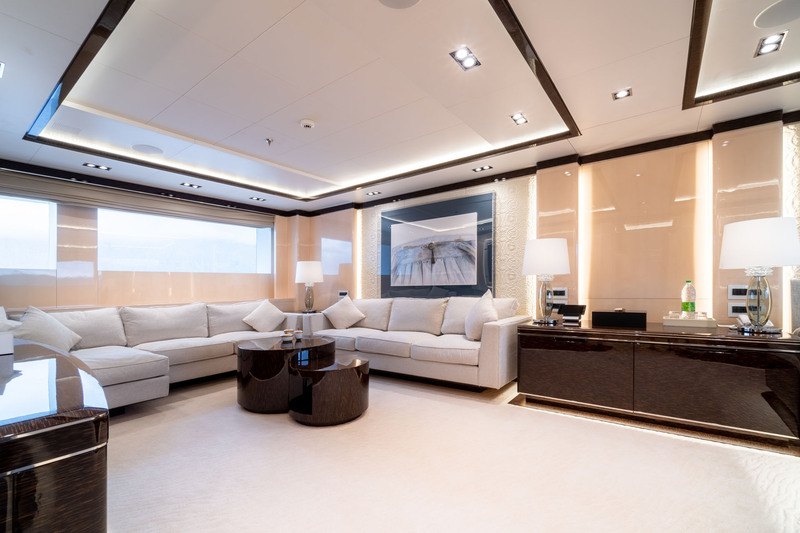 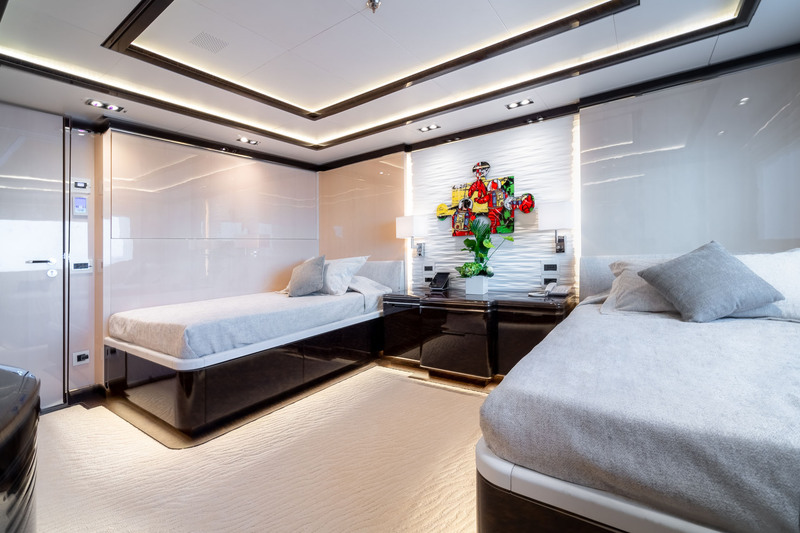 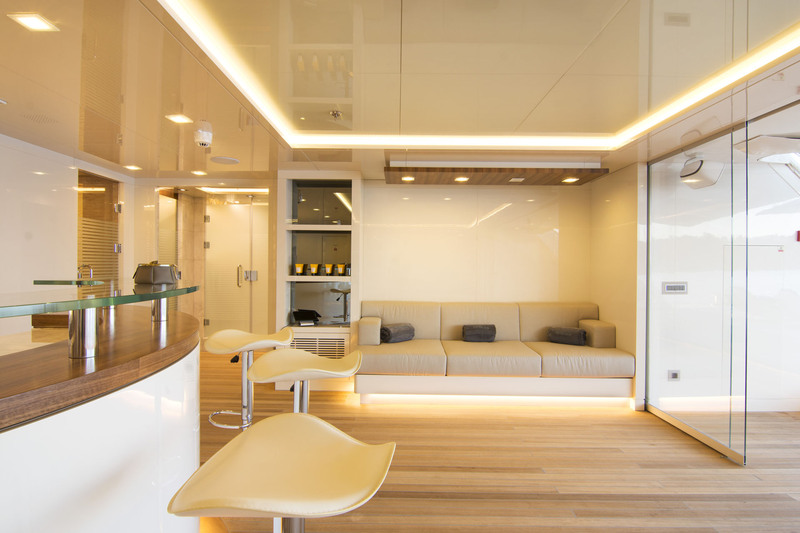 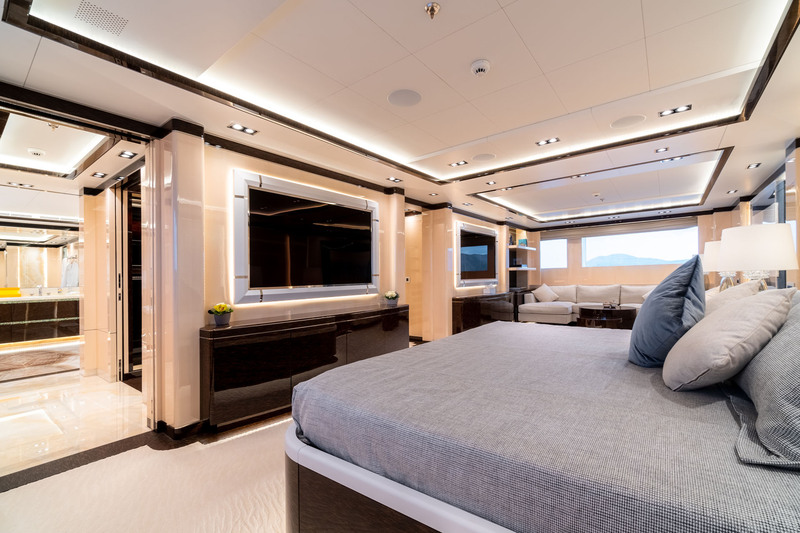 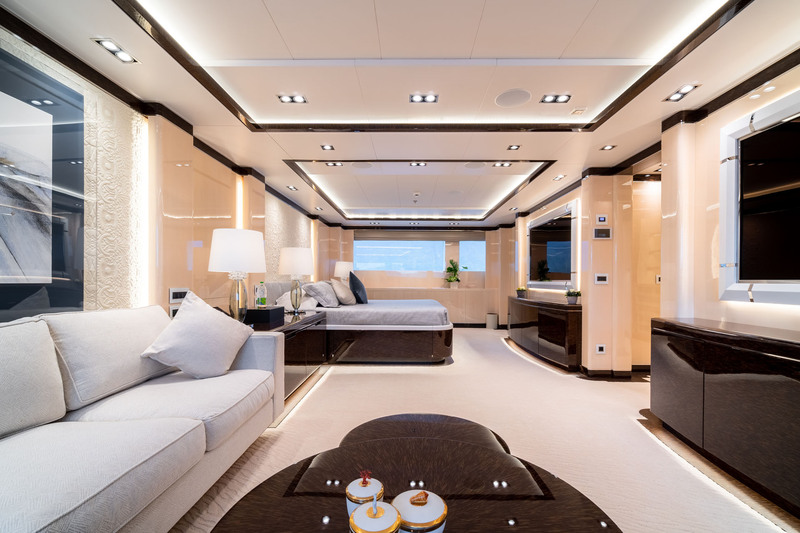 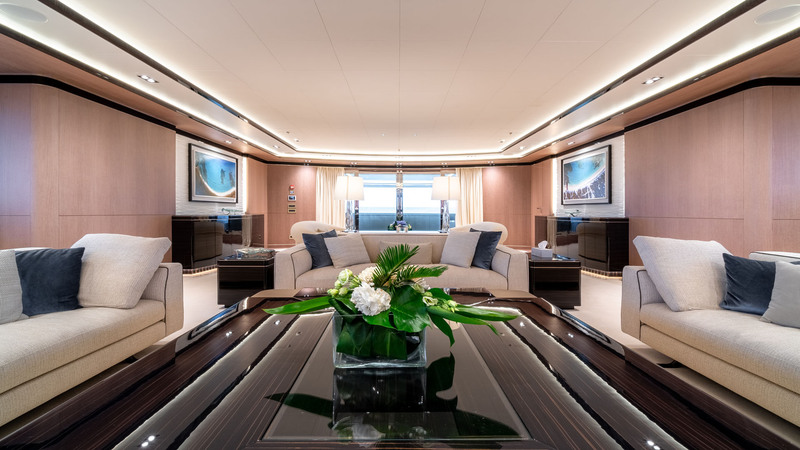 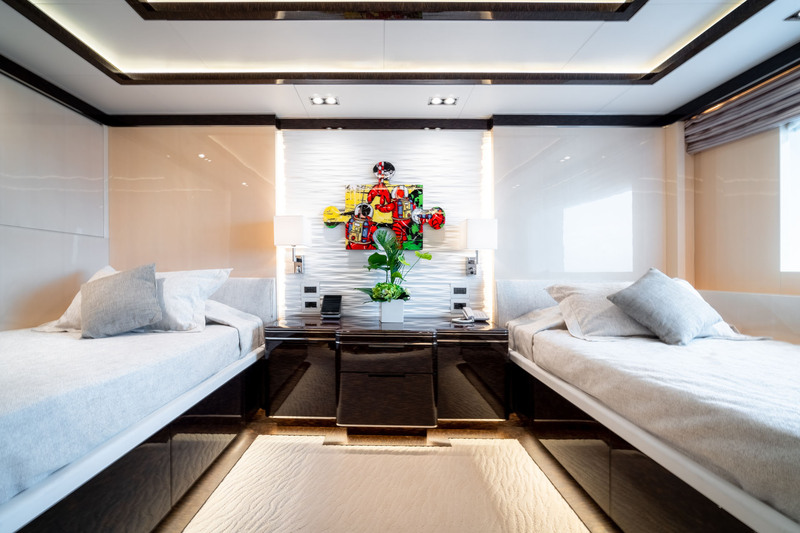 The foredeck is fitted with an elongated sofa with a side table placed on the port and starboard sides. 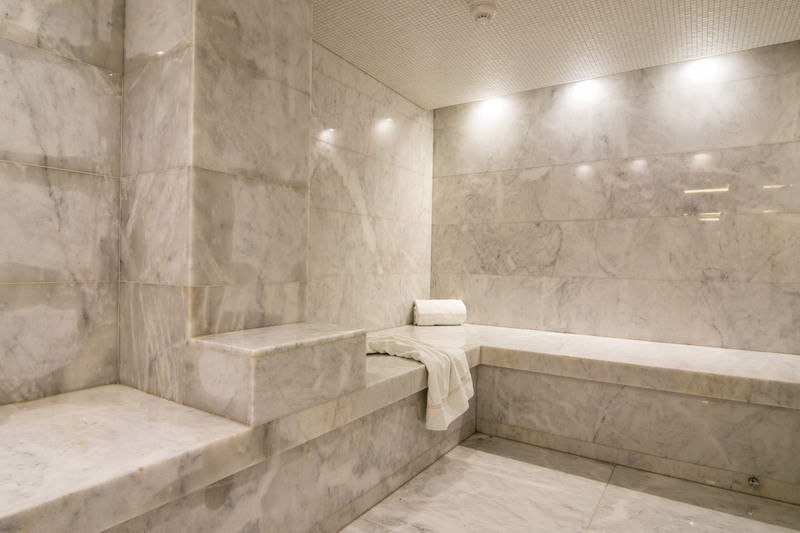 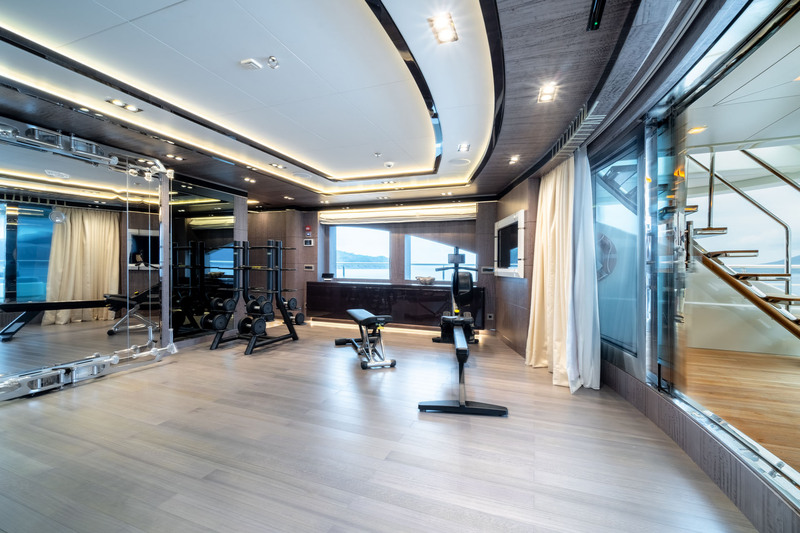 The lower deck has a large beach club fitted with an impressive bar and the steam room and massage room are easily accessed off to the sides. 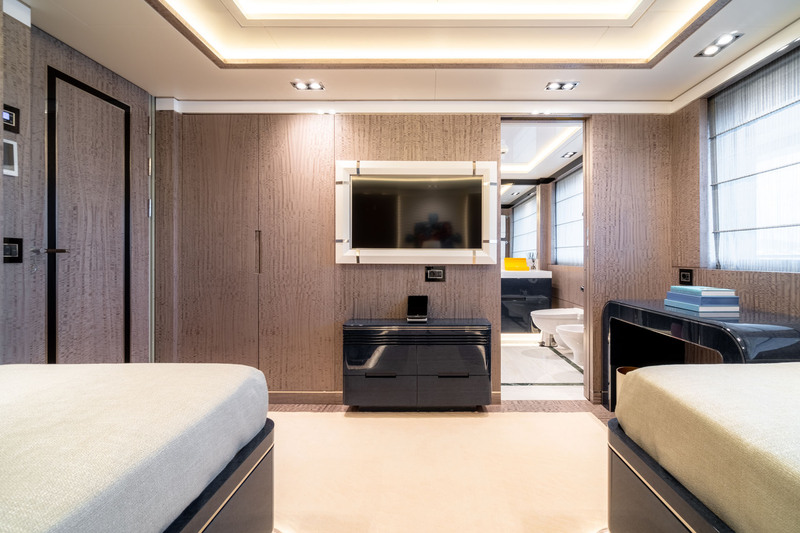 The centre of the lower deck contains the tender garage and the hatch on the starboard side allow for easy unloading and retrieval. 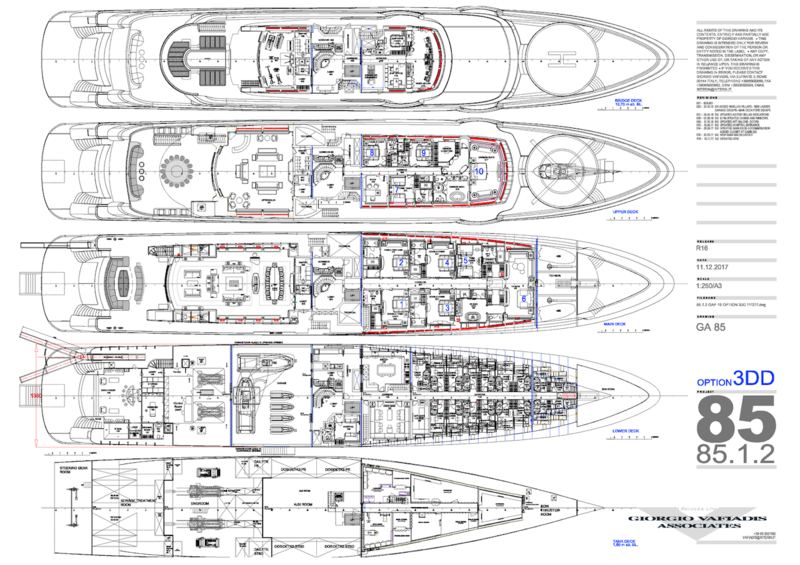 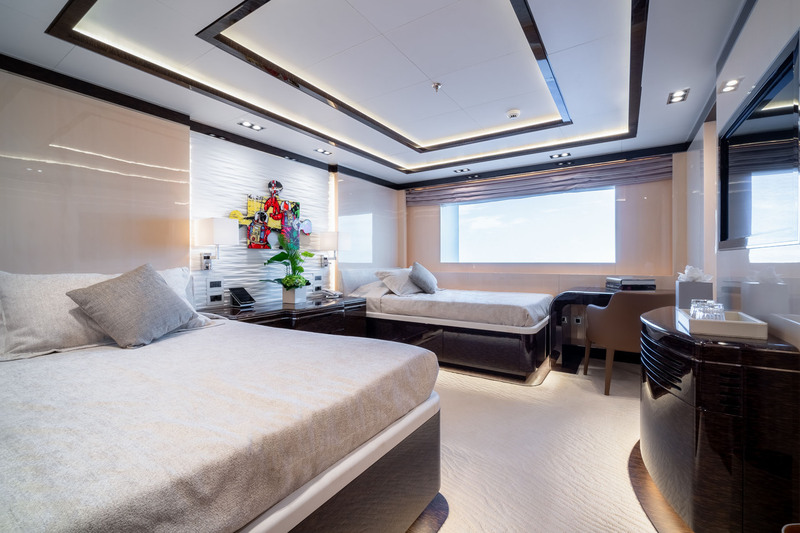 The forward section is dedicated to the majority of the crew accommodation, mess and galley. 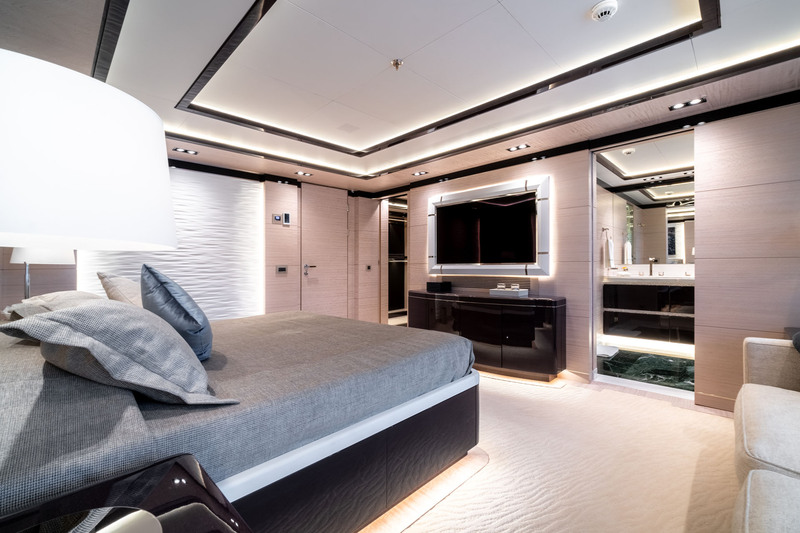 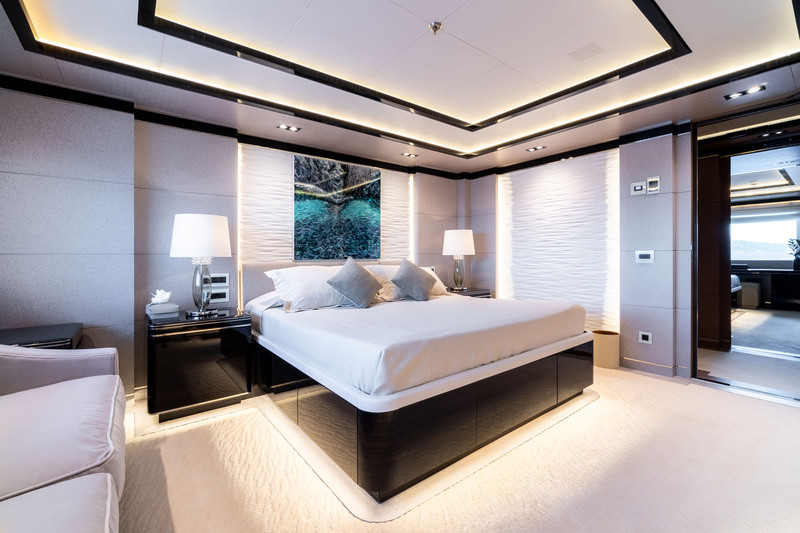 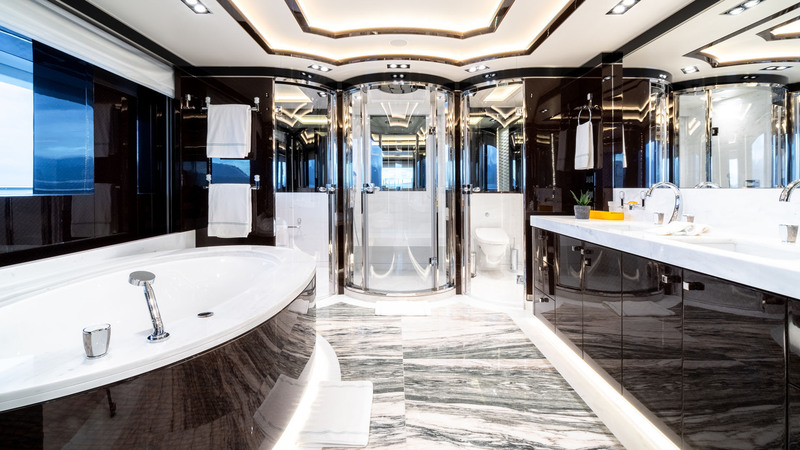 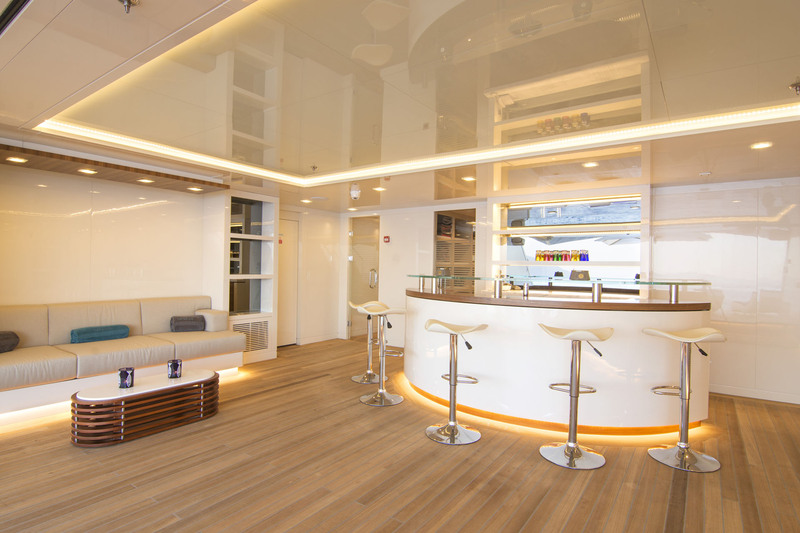 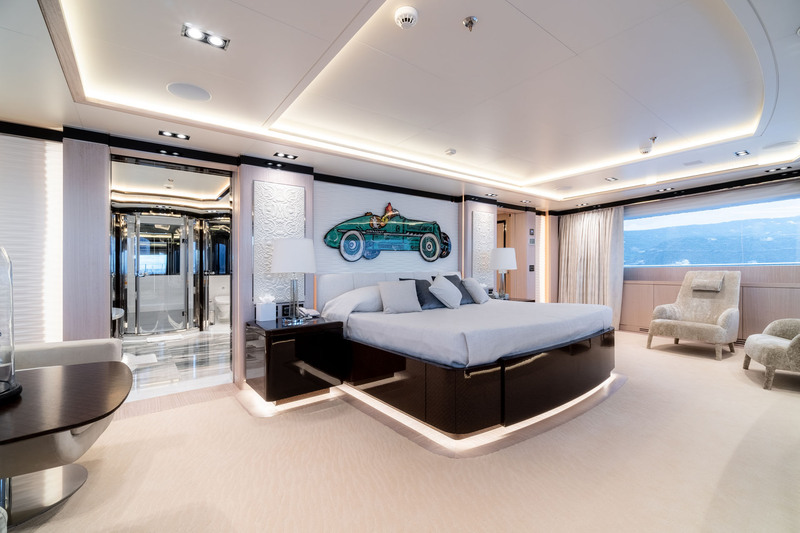 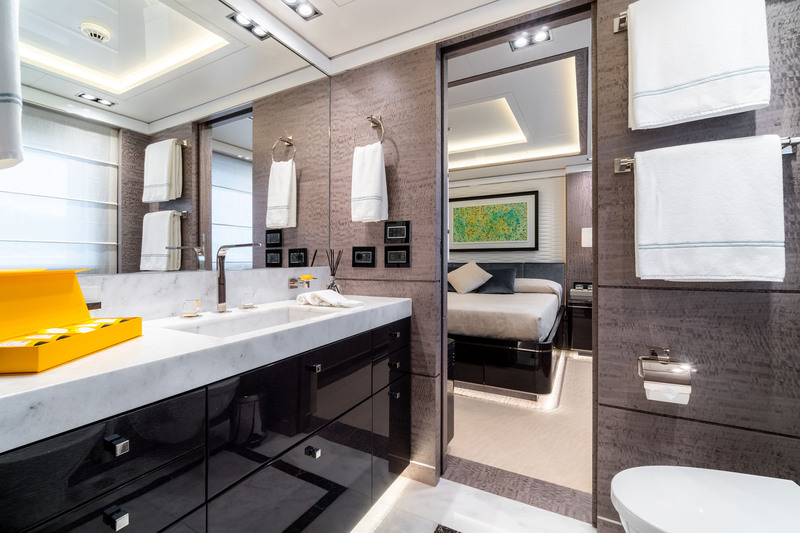 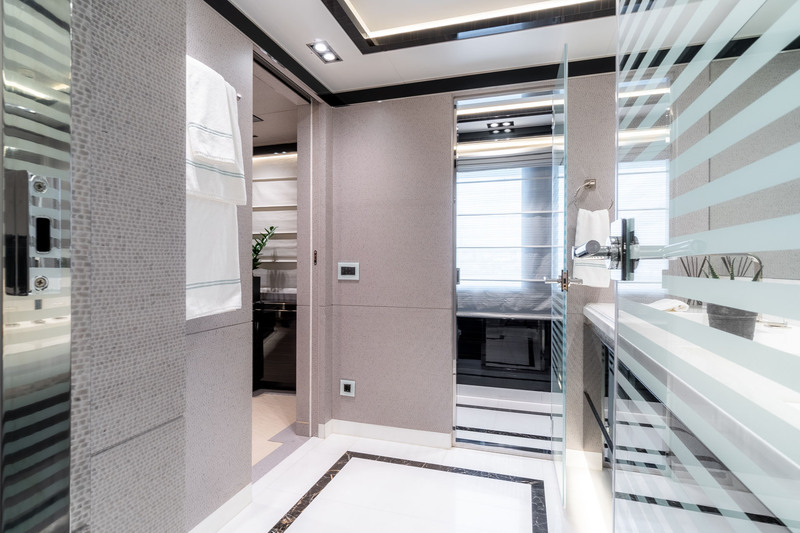 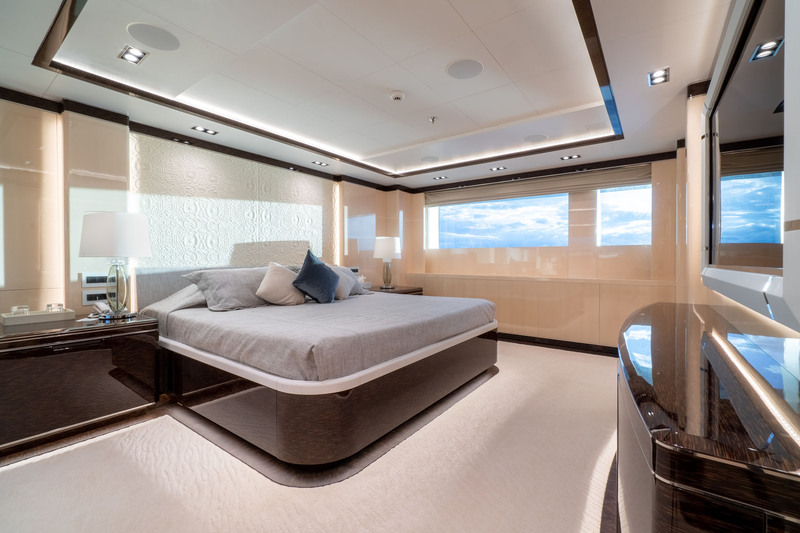 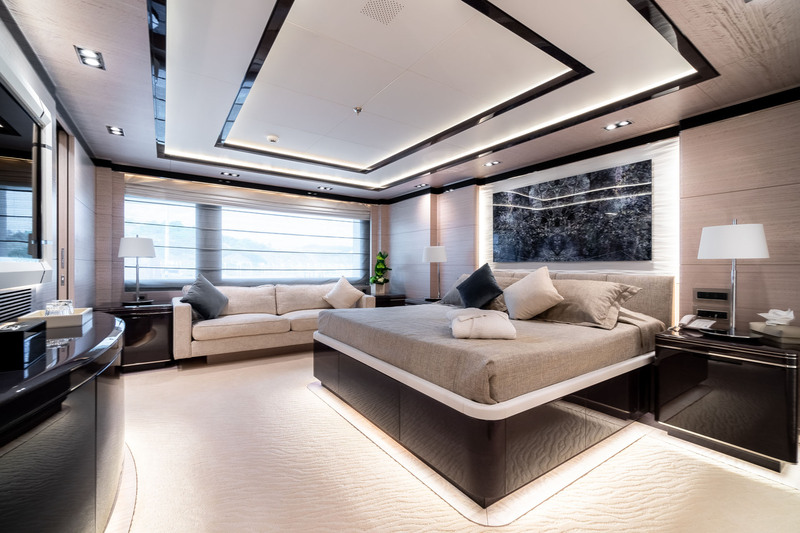 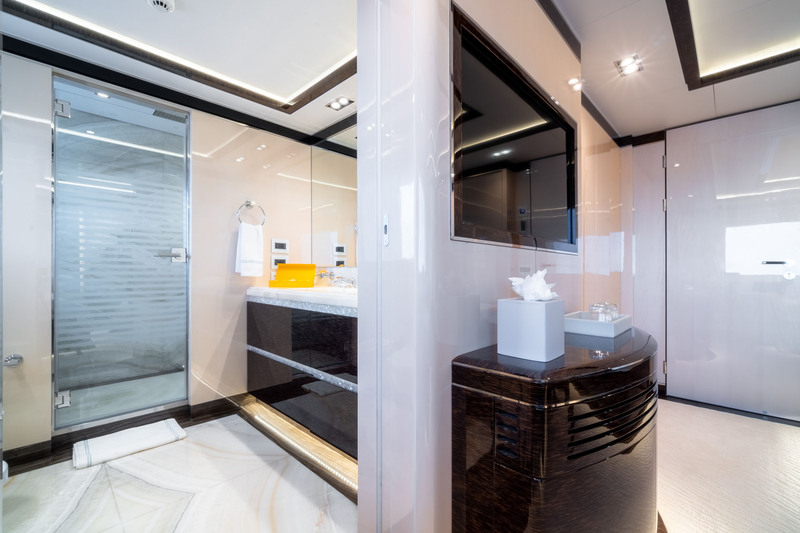 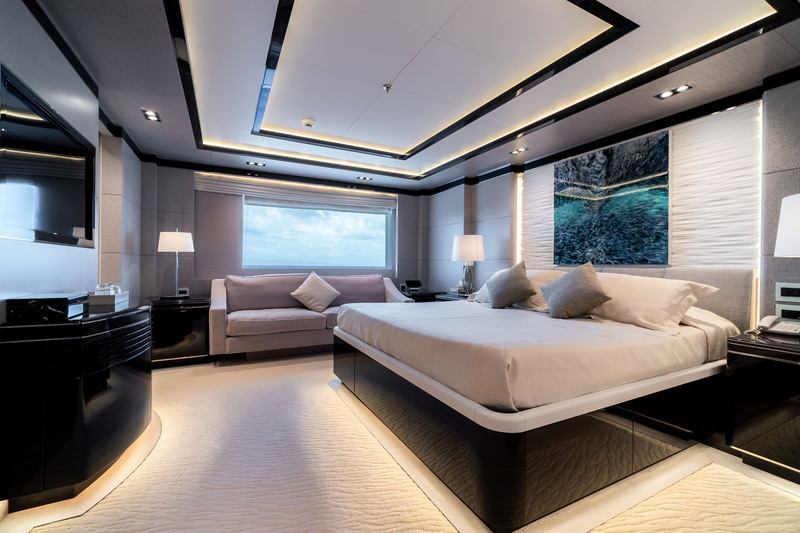 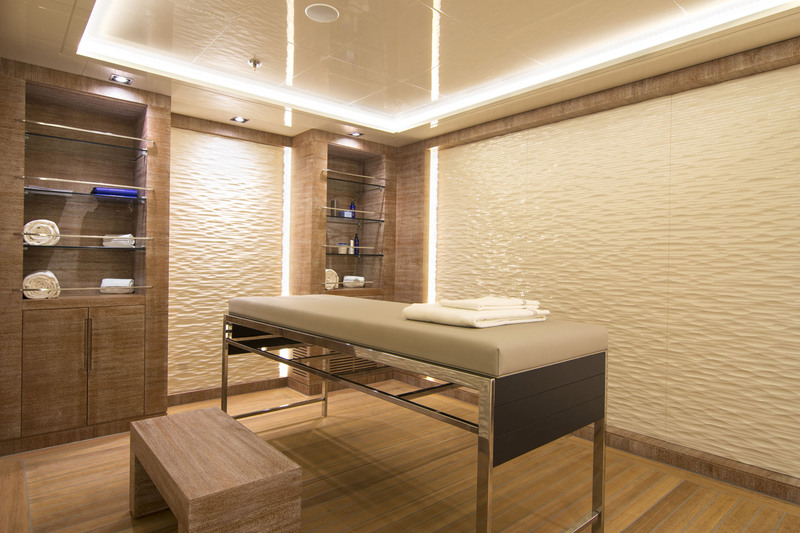 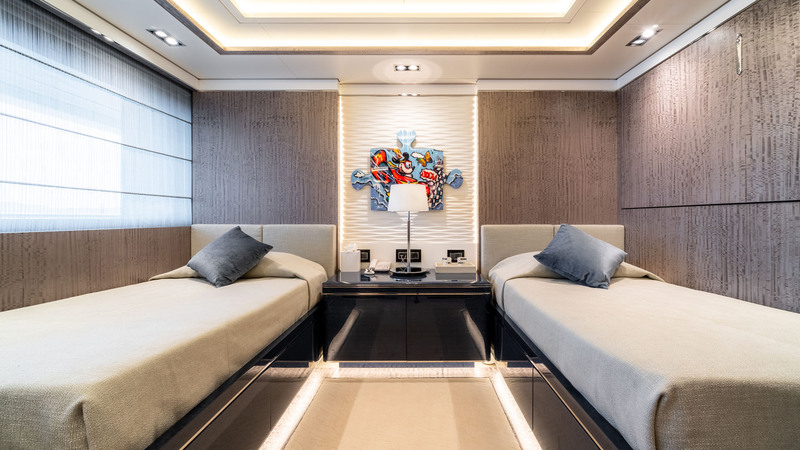 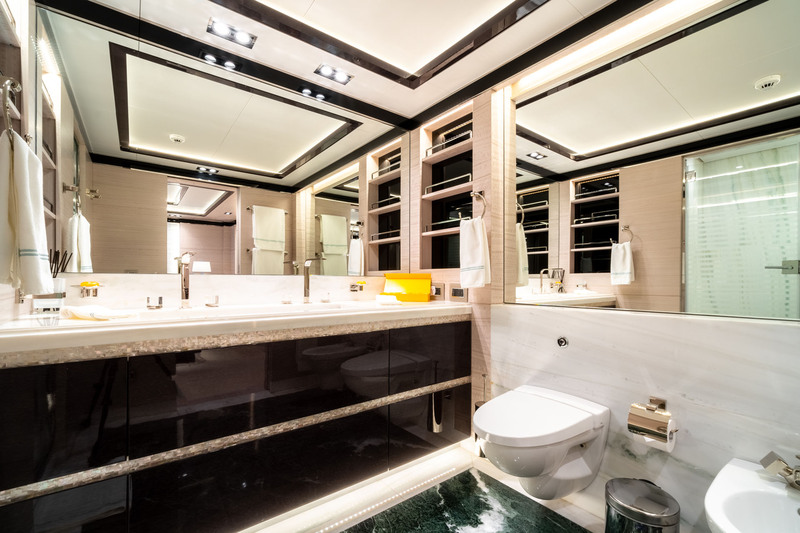 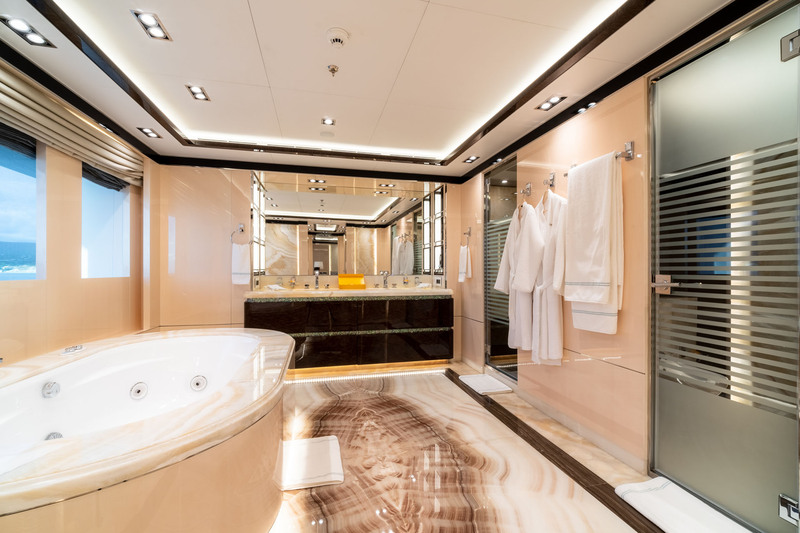 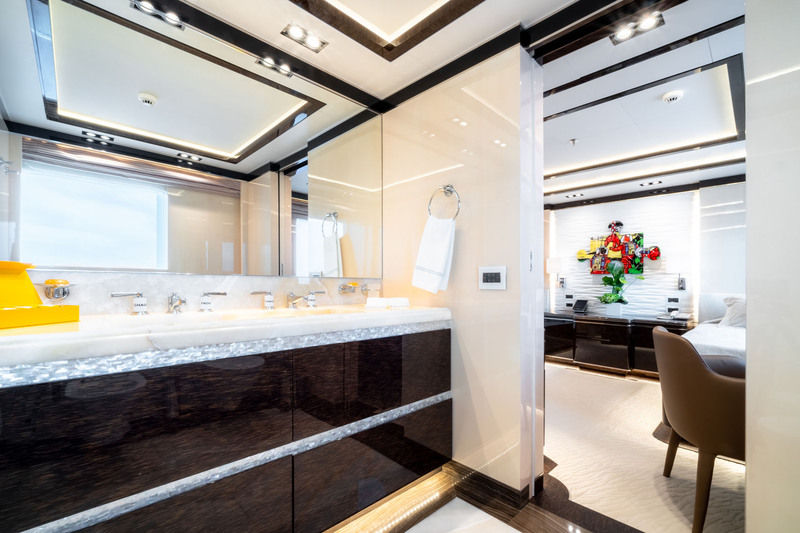 On the main deck, the foredeck hosts the full-beam VIP stateroom boasting a lounge and large en-suite bathroom. 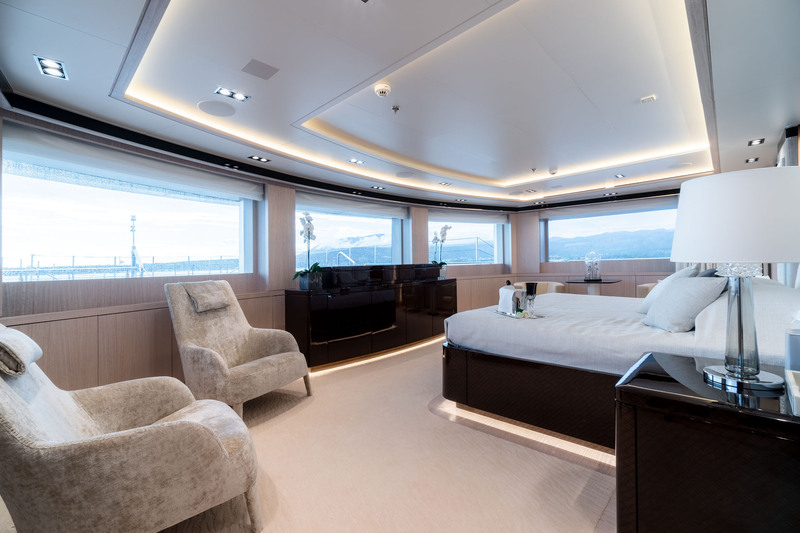 There are also four double cabins, two of which are convertible to twins and a further twin cabin. 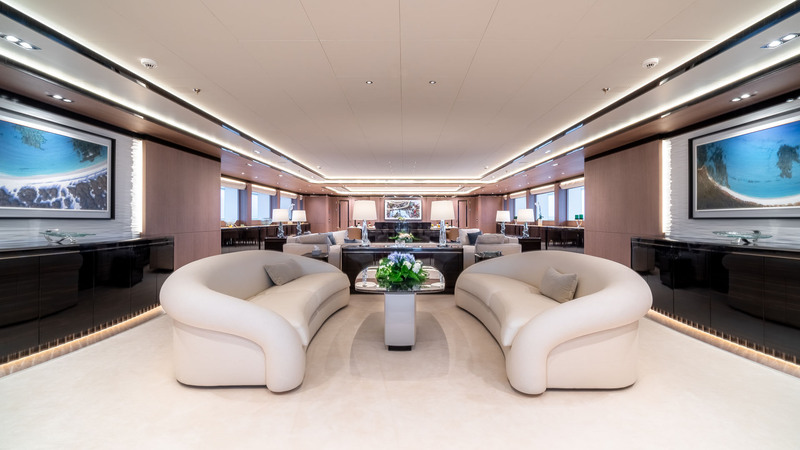 The lobby and lift (elevator) are located in the centre of the main deck, and further aft the open plan main salon offers guests a lavish and immaculate environment in black and white. 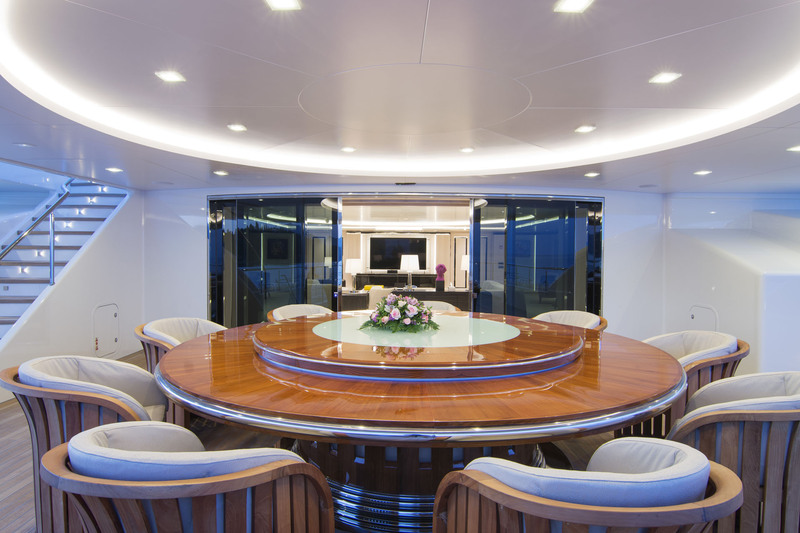 The formal dining area seats up to 16 guests at a grand oval table. 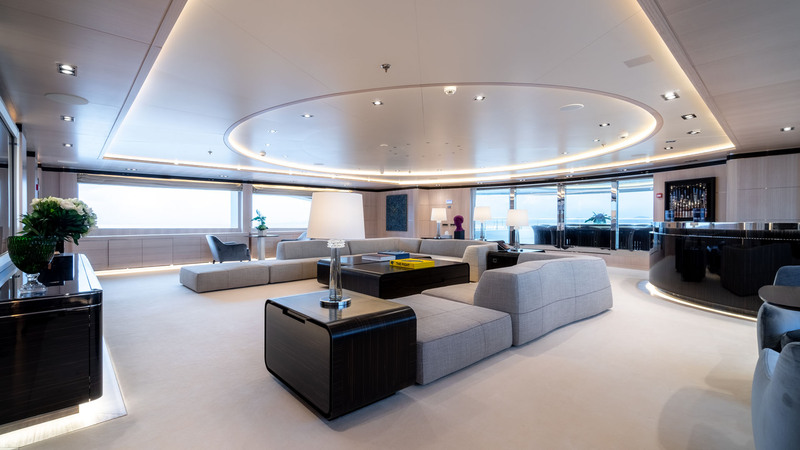 A grand piano will entertain guests while they dine or sit on one of the three sofas surrounding a coffee table. 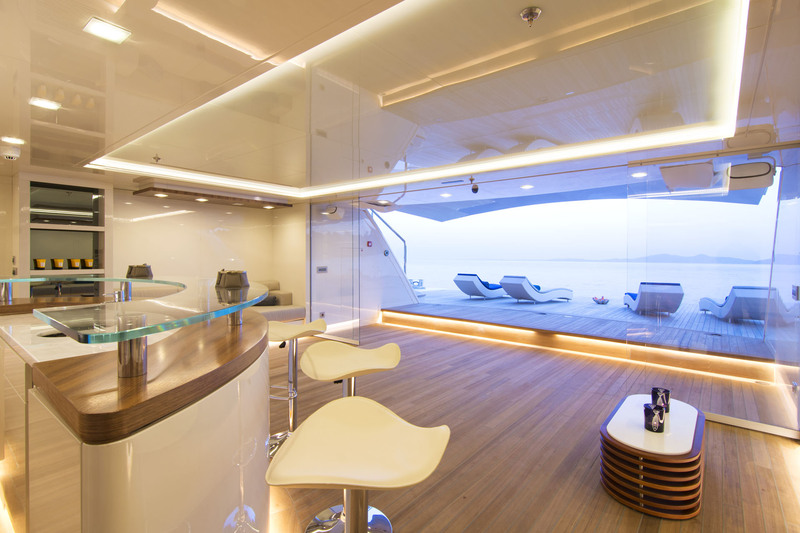 To the aft, there is a second lounge close to the sliding doors leading outside. 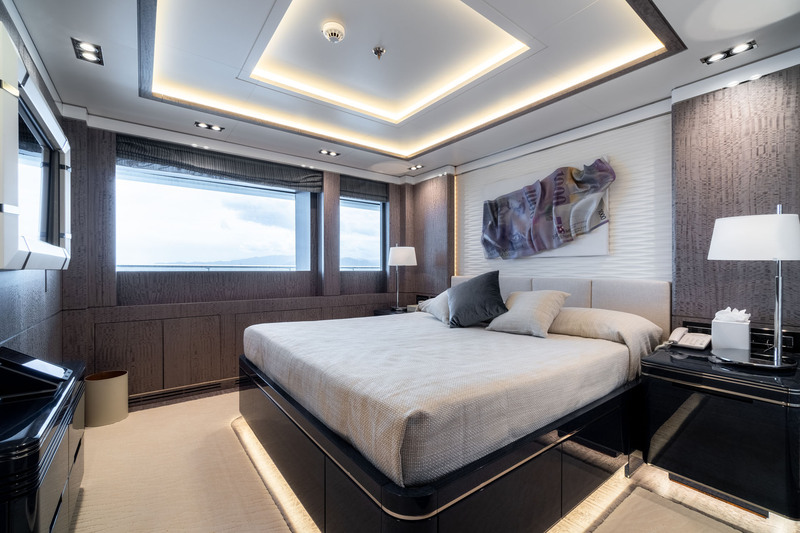 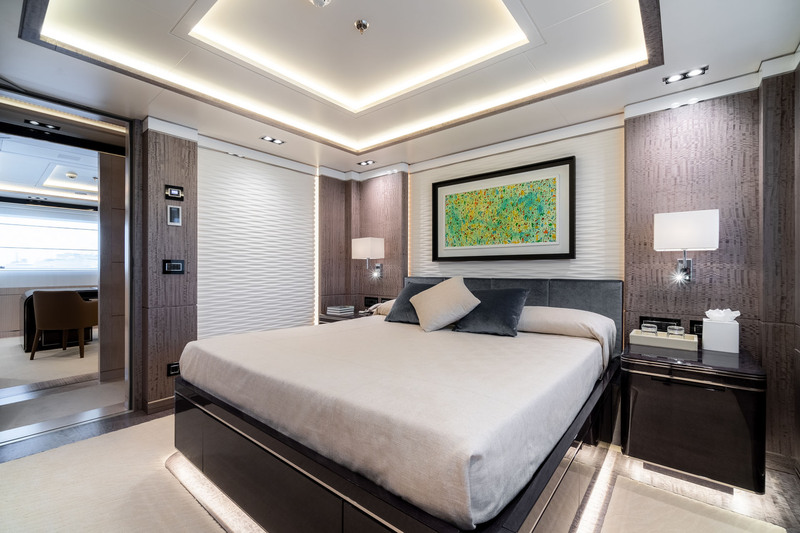 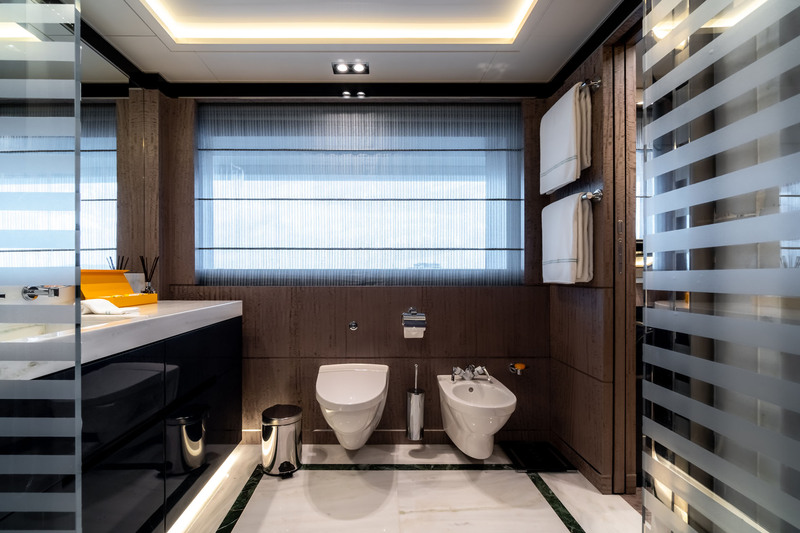 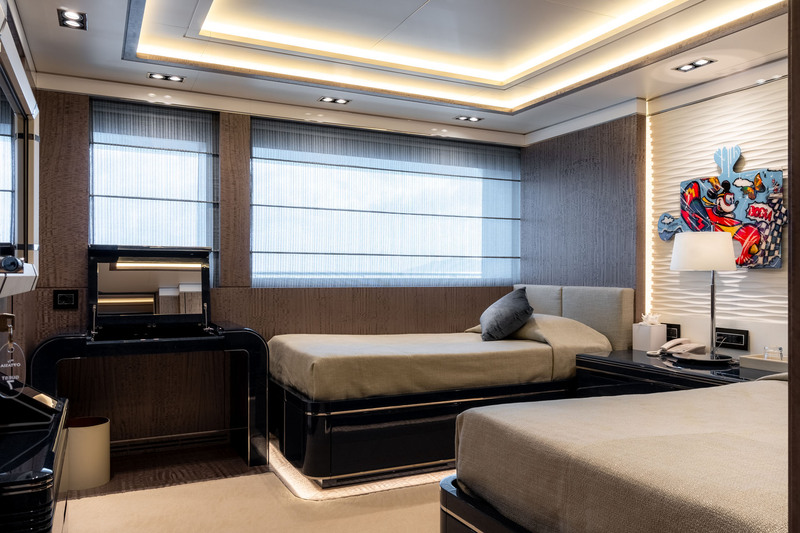 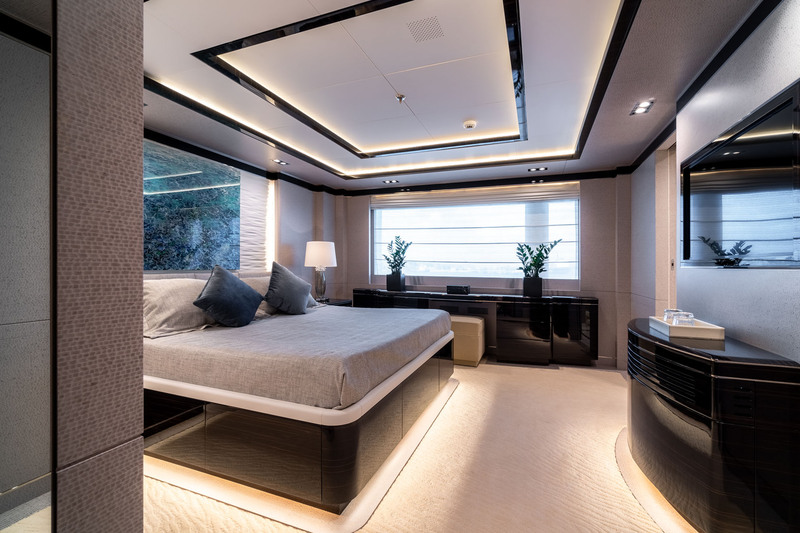 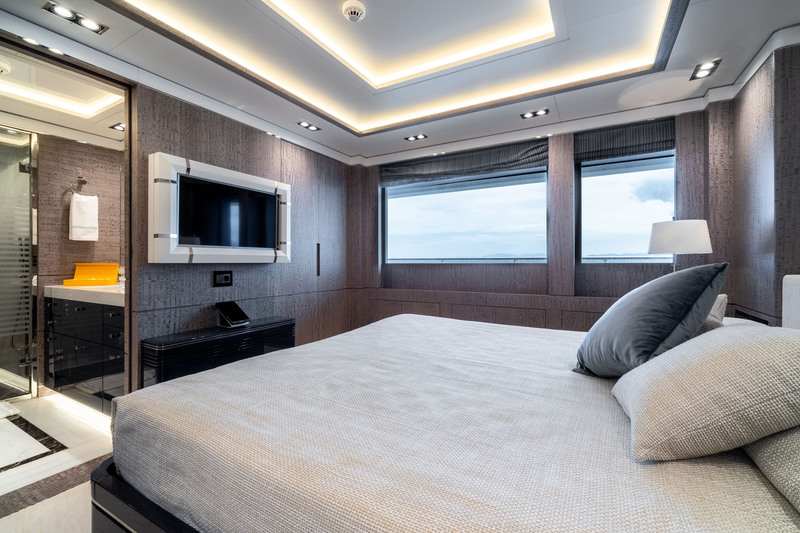 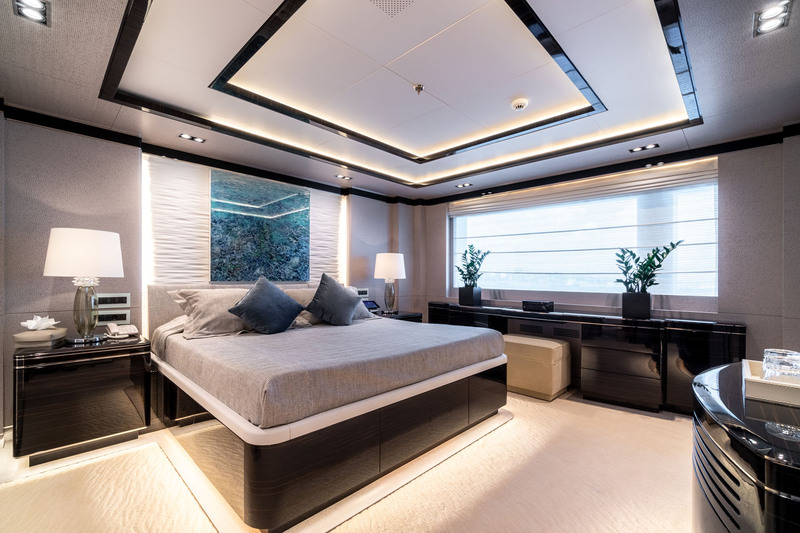 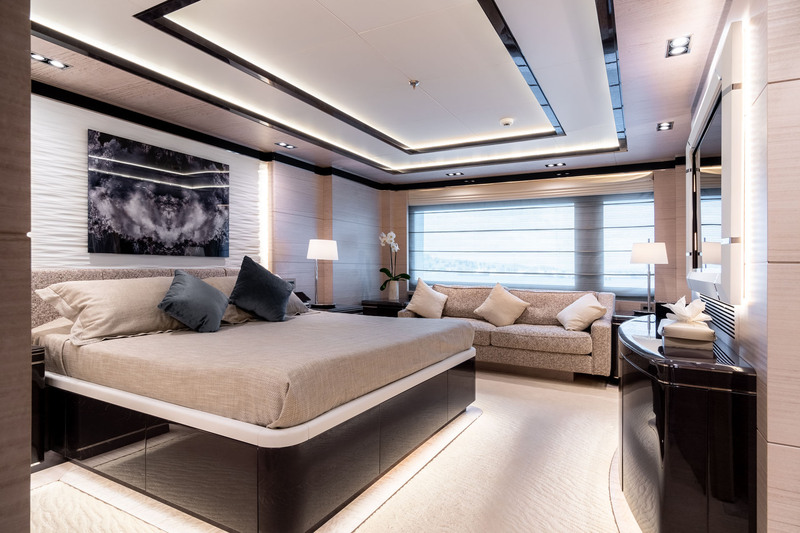 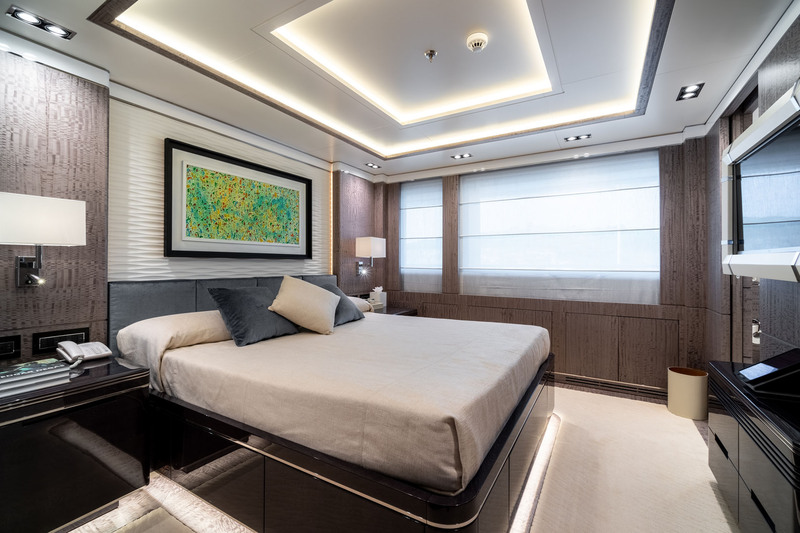 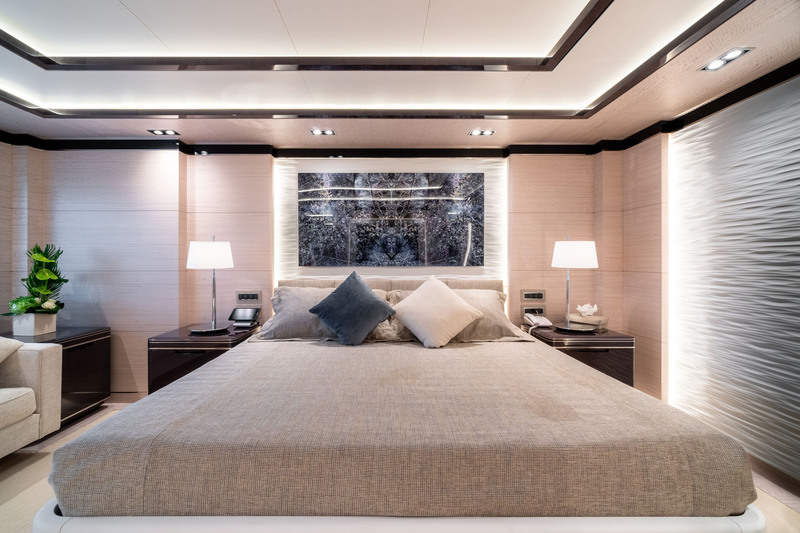 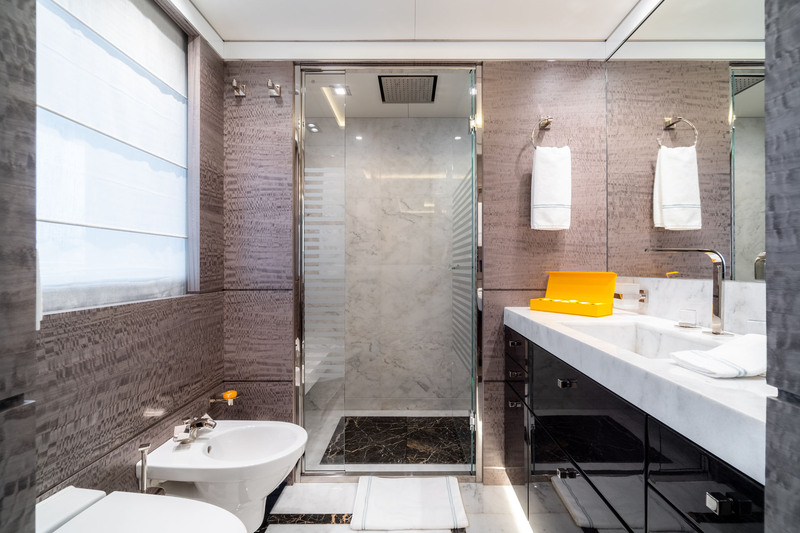 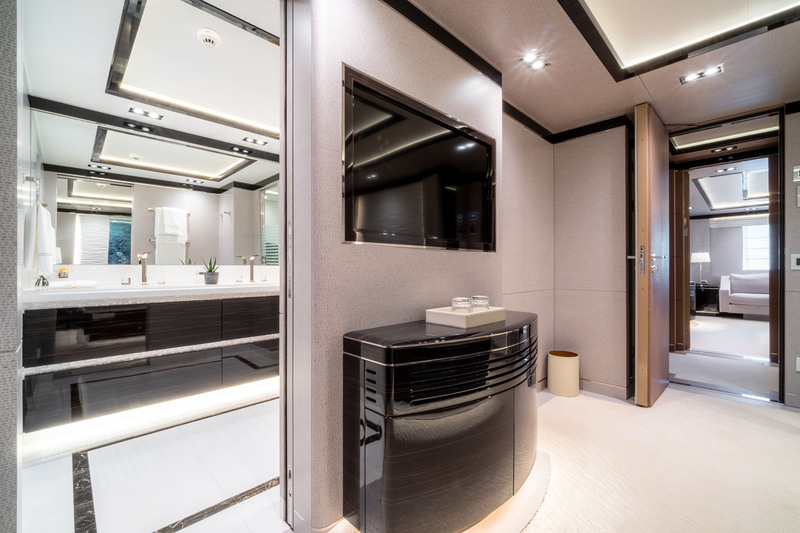 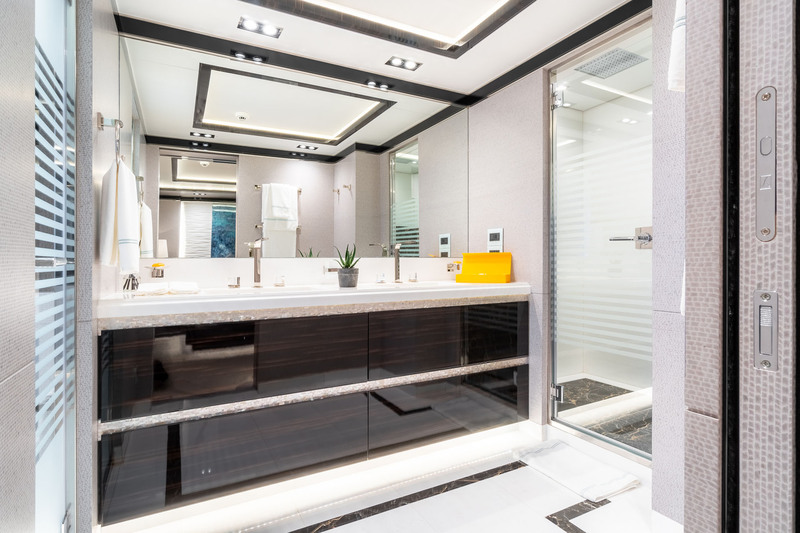 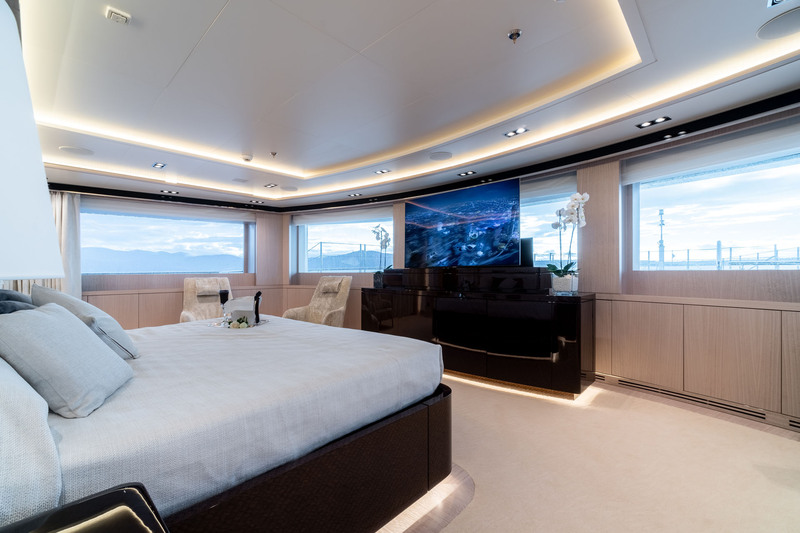 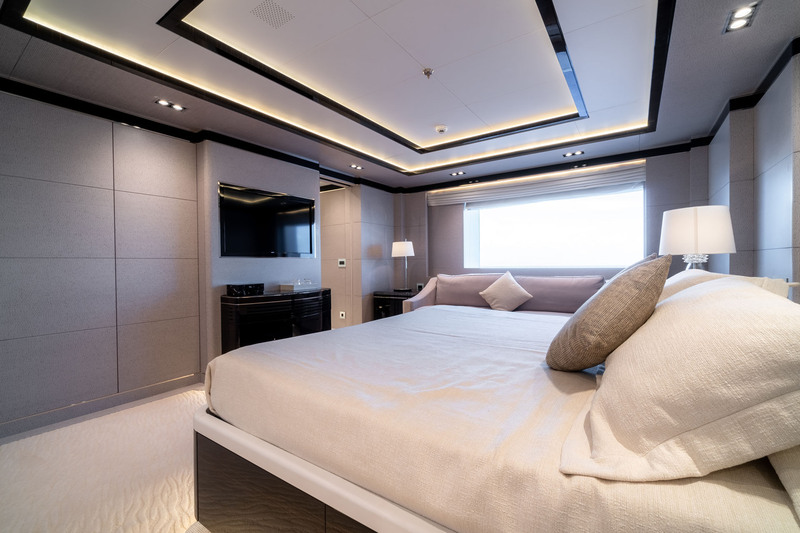 The upper deck foredeck holds the remainder of the guest accommodation - the full-beam Master suite showcasing exceptional forward views, a private lounge, walk-in wardrobe and massive en-suite bathroom with tub. 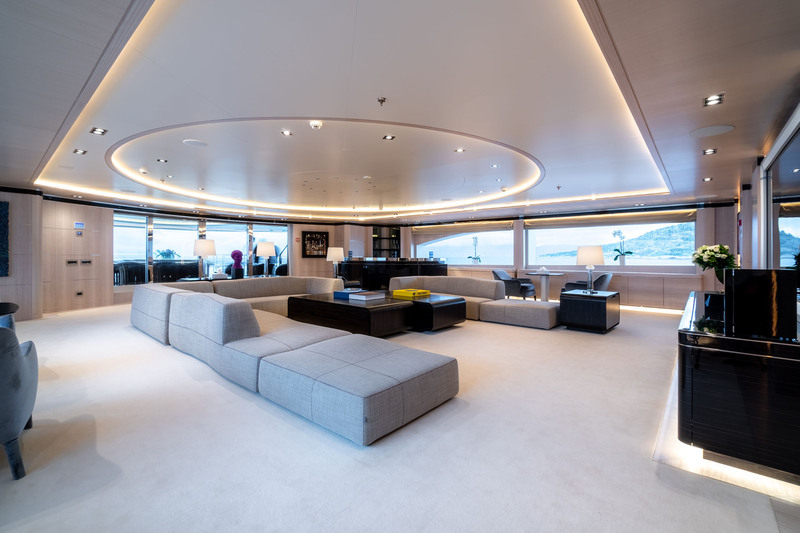 There are two additional double cabins, a twin cabin that can be converted into a hospital, and a study that can be used as an office. 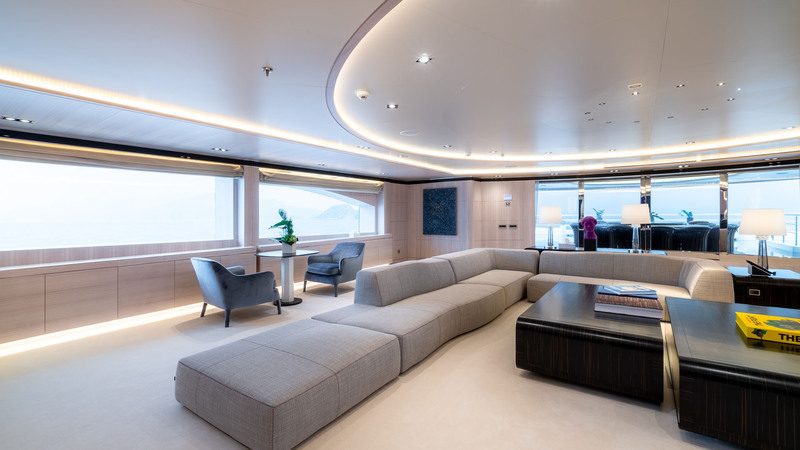 The sky lounge follows the same design of the main salon, bringing together pale wooden panelling and textured white surfaces that emphasise the table tops and furnishings in Makassar. 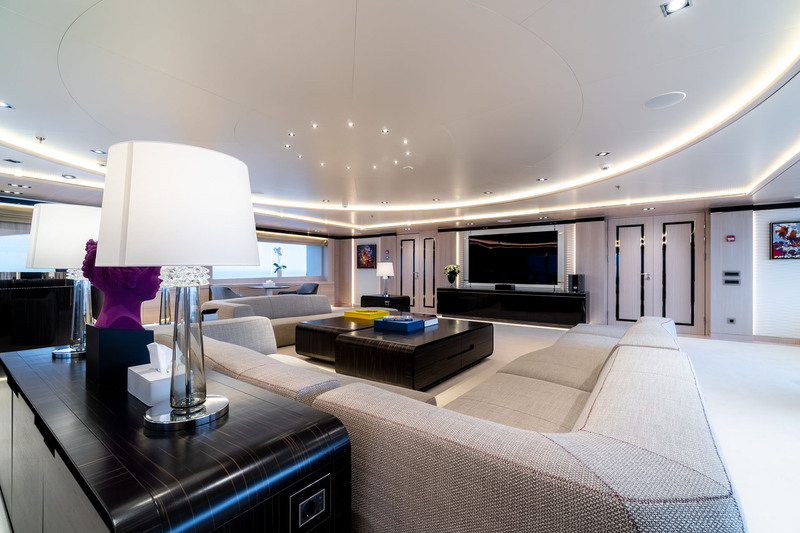 Three generous sofas and a coffee table are positioned in front of a wall-mounted widescreen TV to create the ideal setting for film nights, while the aft port sidewall is equipped with a bar and opposite a seating area for up to four guests. 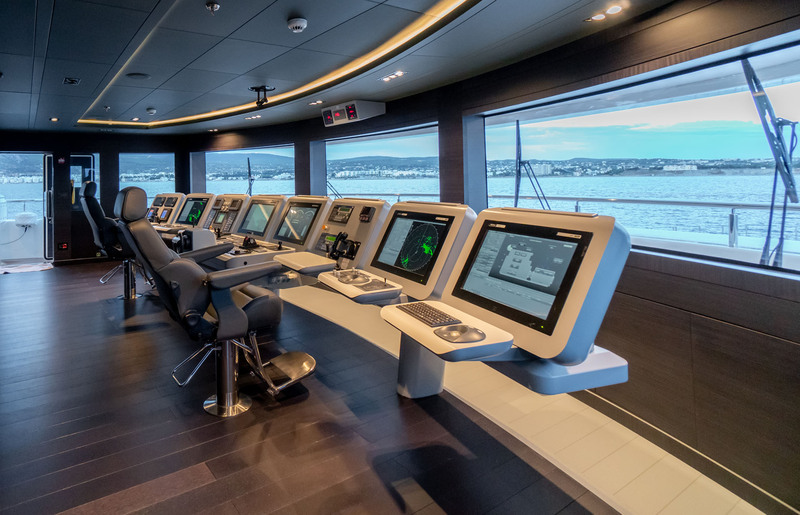 The forward bridge deck is home to the helm station, the captain's cabin and the emergency room. 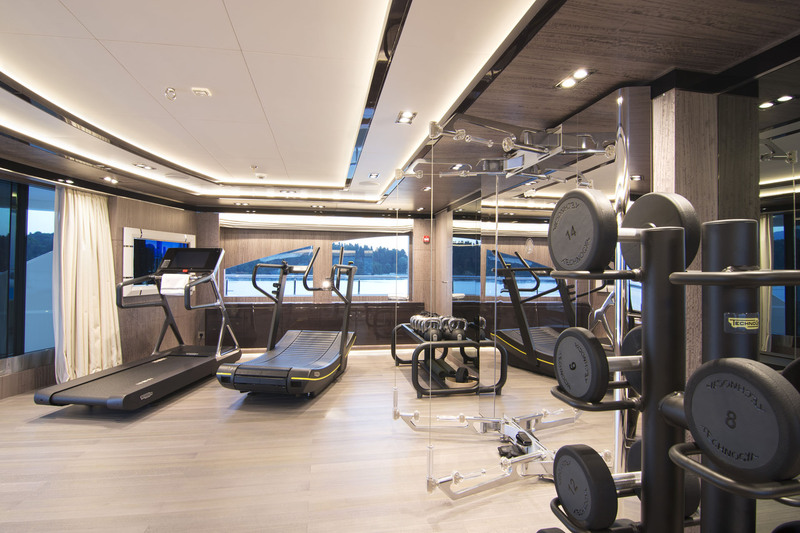 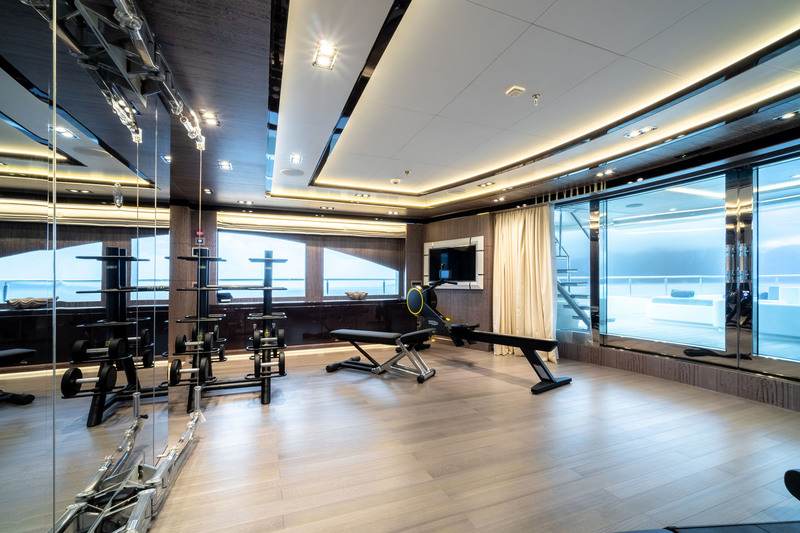 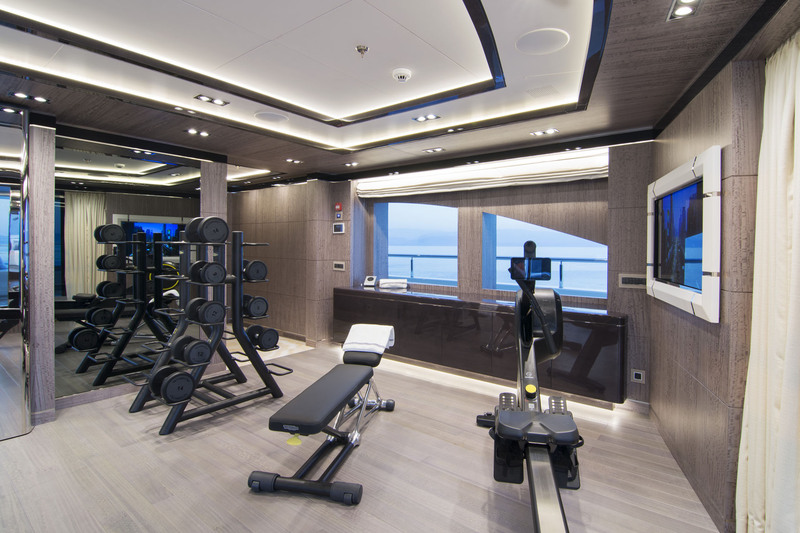 Aft of the lobby, the fully-equipped gym will ensure that guests can wear off excess energy while in transit and enjoy amazing elevated views. 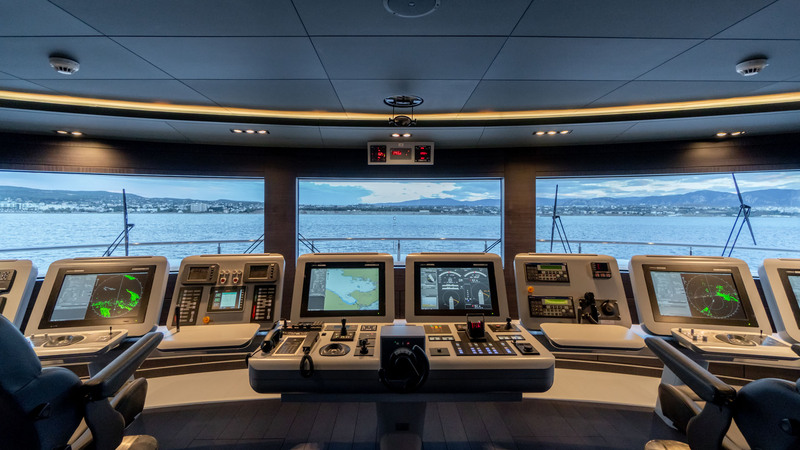 2 x CAT 3516C engines produce a top speed of 18 knots and a cruising speed of 16 knots. 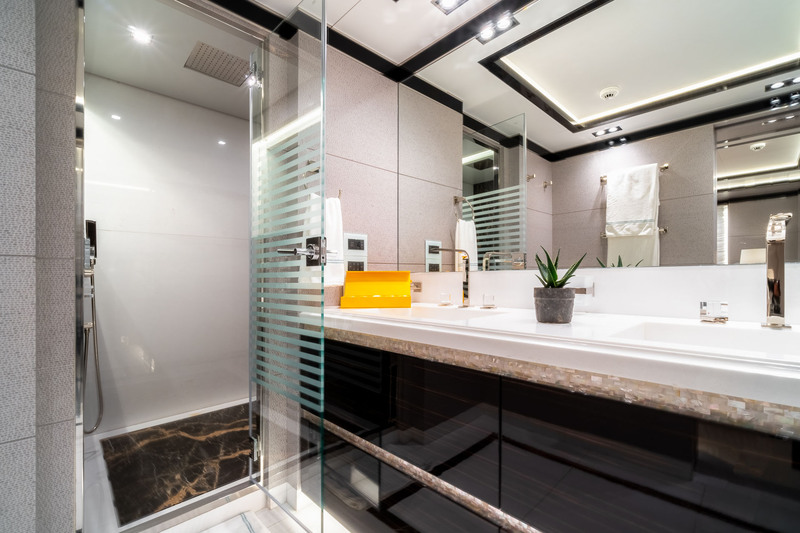 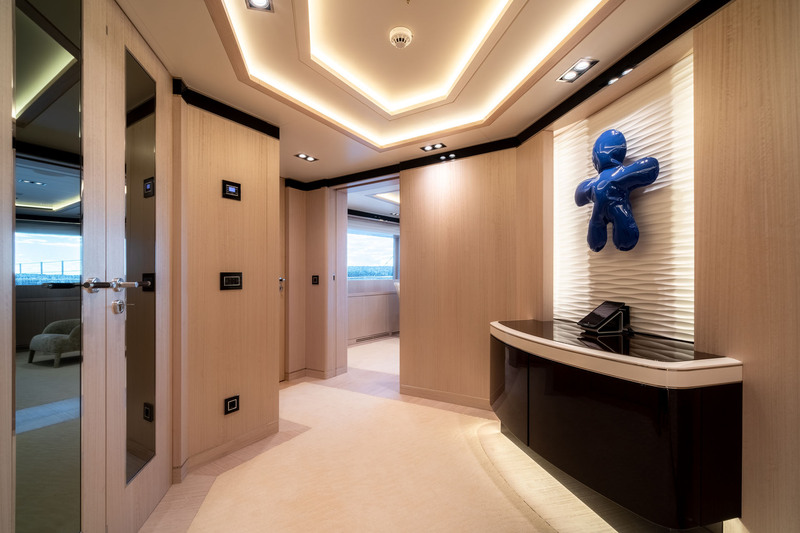 The accommodation provides for up to 12 guests across 11 cabins: 1 Master suite, 1 VIP stateroom, 6 double cabins, 2 twin cabins and 1 twin cabin convertible to a hospital. 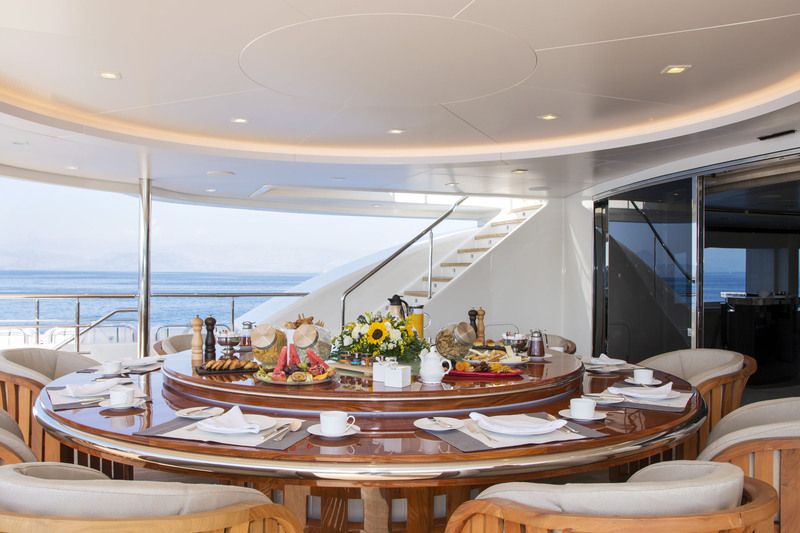 The crew of 26 will provide for all guests and visitors during dockside celebrations.